Social media is a gift and a curse when you live in the “other” Midwest (which excludes Chicago, St Louis, etc.) Every week I’m exposed to great events that are impractical to attend (I’ve talked myself out of a $500 plane ticket for a one-day event more than once). 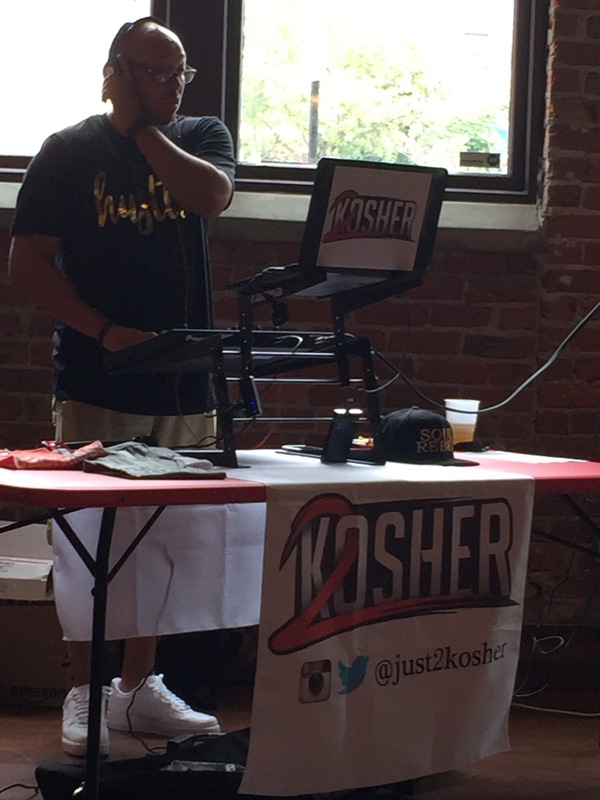 So when Anthony Smith of Everythang’s Kosher announced he would be implementing monthly R&B (and reggae, and hip-hop and every other music genre I enjoy) themed brunch day parties I was sold. 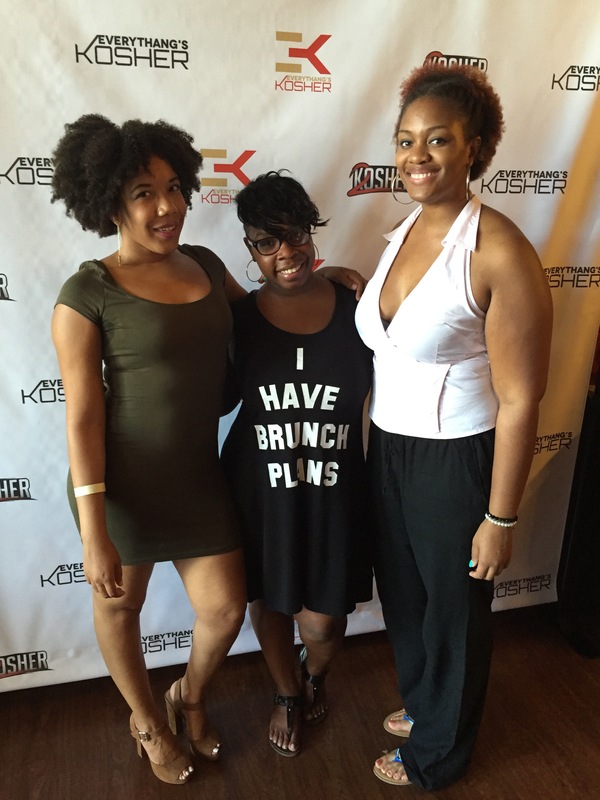 No longer would I be envious of the Brunchbounce and Views from the Grits crowd. Now, Omaha would have its own “thing”. So on a sunny Saturday in July, I rallied my two closest friends and got ready to party. 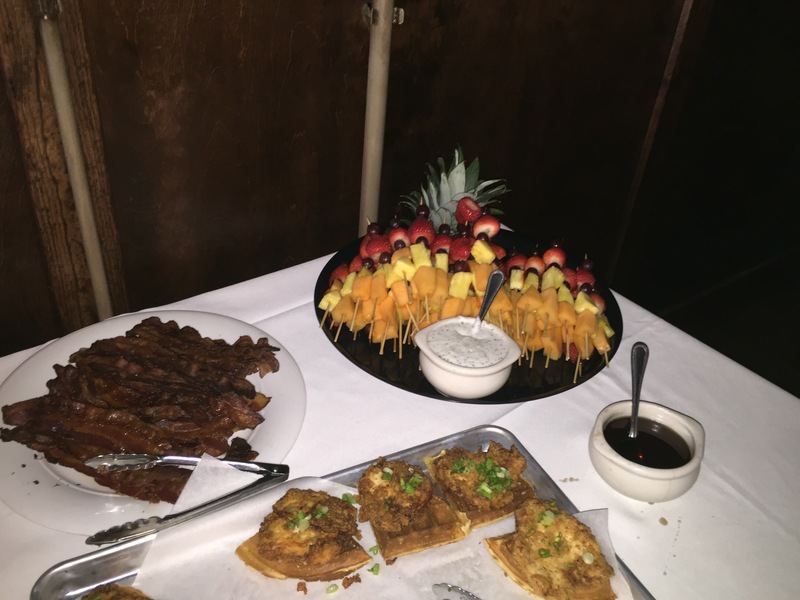 The inaugural Rhythm & Brunch was held in the Jackson Street Tavern Annex which had space for a dance floor, bar and breakfast buffet. Though the interior was a bit small but for the first event it was perfect and gave a real intimate feel. It also didn’t hurt the optics since the smaller space looked full without having to rely on a huge first crowd. 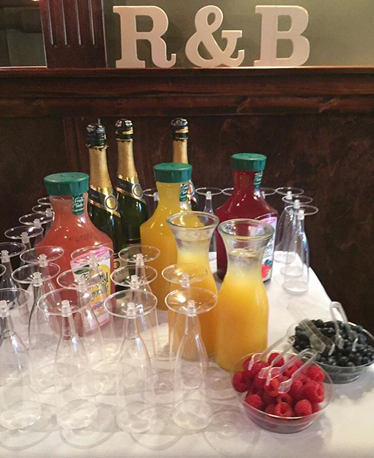 I, of course, made a beeline to the complimentary mimosa bar which offered the standard o.j. alongside cranberry and mixed berry juice. Blueberries or raspberries could be added if you were feeling fancy as well. A full cash bar ensured attendees were appropriately turnt, especially those who opted for the $10 unlimited rum punch. I love themes and specials so hopefully there’s a new drink next time or specialty shots. 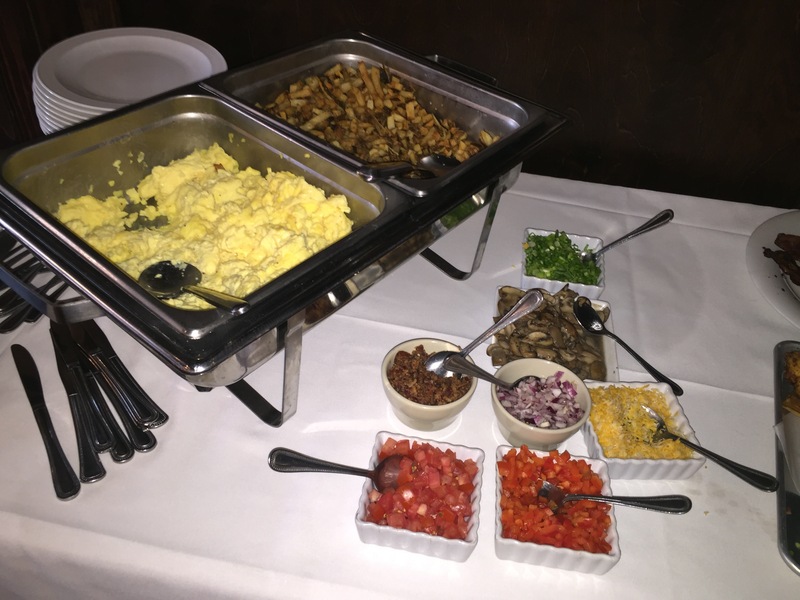 The brunch buffet included bacon, a scrambled eggs bar, fruit, home fries and chicken & waffles. There were more hits than misses including the perfectly cooked bacon and scrambled eggs bar which I enjoyed for the variety. The home fries, unfortunately, were cut too small and ended up being dry and the waffles on their own were too blah. 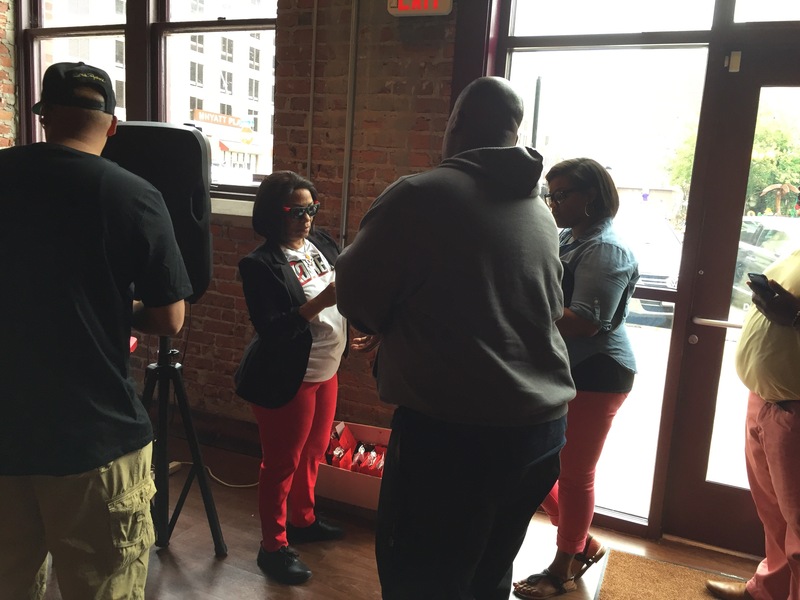 Arguably, the selling point of RnBrunch is the music. The one aspect Anthony is in full control of is consistently stellar. Imagine every song you love but haven’t really considered the possibility of it getting played when you’re out. Then imagine you get to hear one or two of them mixed with new Drake, Bey, bounce music and reggae. If you don’t find yourself singing along the whole time or twerking in your seat I don’t know if we can be friends or what you’re doing with your life. Above all, I admire Anthony’s drive to make this event better. Not discouraged by Omaha’s notorious reputation for not showing up, he still plays the best music, searches for better venues and gives back whether it’s a discount for partner organizations or donating proceeds to causes he holds near and dear (August’s Rythm & Brunch will donate 50% of the proceeds to help Baton Rouge during their time of crisis). Both the event and the intended audience has a journey ahead to perfection, but it will get there .. if only Omaha lets them. 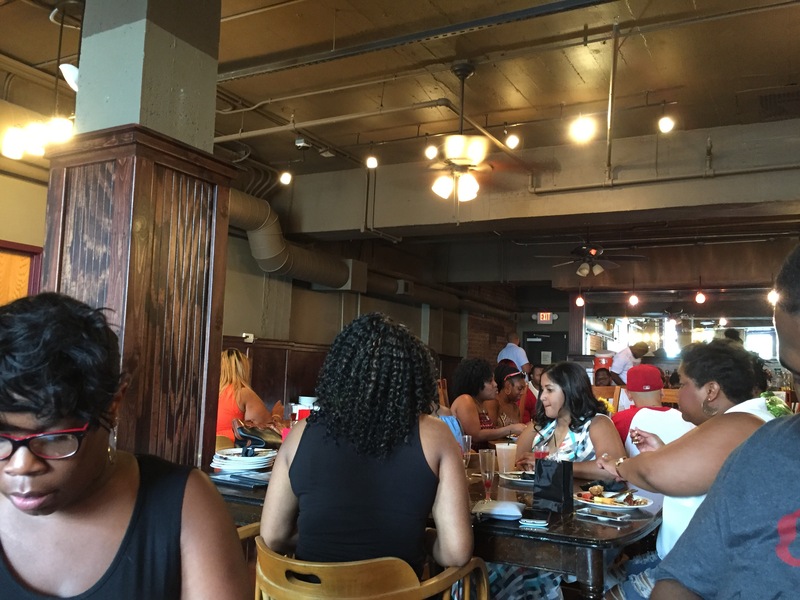 Tickets are now on sale for the August 27 RnBrunch. Brunch tickets are $20 and available until next Thursday. General admission is $10. I ate at every Flagship Commons restaurant so you could feel like you did too. I’m sure I’m not the only person who avoids Westroads. So many people, a high likelihood someone else will be wearing something you buy there and did I mention so many people (you’ve probably been avoiding since high school/college). So when Flagship announced their plans to open a food hall, I was intrigued. Mainly because I missed the easy access T.G.I.Friday’s had in the location and particularly as a reason to re-explore Westroads, which in its defense has added a lot of things (H&M, expanded Forever, the soon to be opened Container Store, Canes). I’m not a huge fan of the other dining options surrounding Westroads (don’t tell me how good Cheesecake Factory is … I don’t care) and liked the concept of not waiting forever for a decent meal that didn’t include mystery meat. So for the last eight months, I have been visiting Flagship Commons, eating at every concept at least once and forming lots of opinions and a few favorites. The only exception was Aromas, as I’ve had them tons of times and coffee doesn’t really depreciate in a new location. 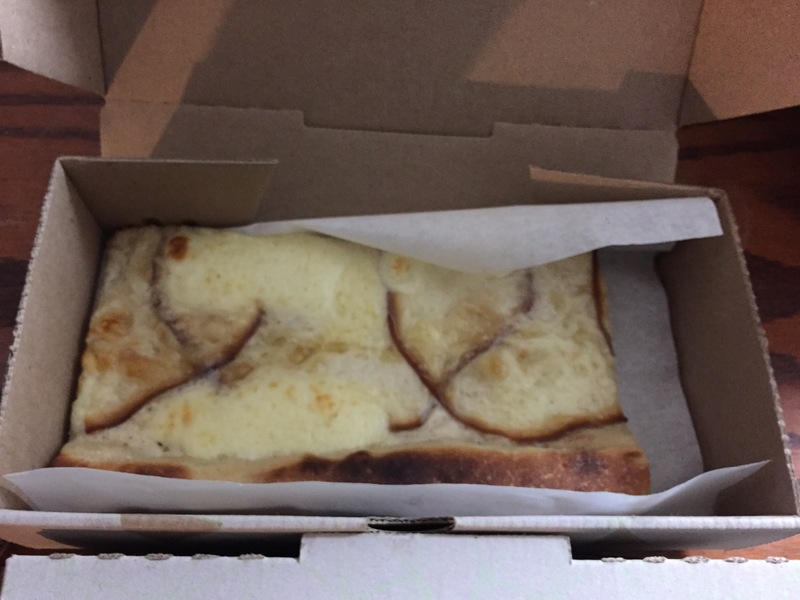 I did snag a cinnamon roll in passing on Sunday and they were delicious. My initial visit to Flagship came as I was attempting to not get sick before a New Year’s Eve trip. Immediately I knew steaming broth would be the answer but didn’t want to potentially contaminate the masses. 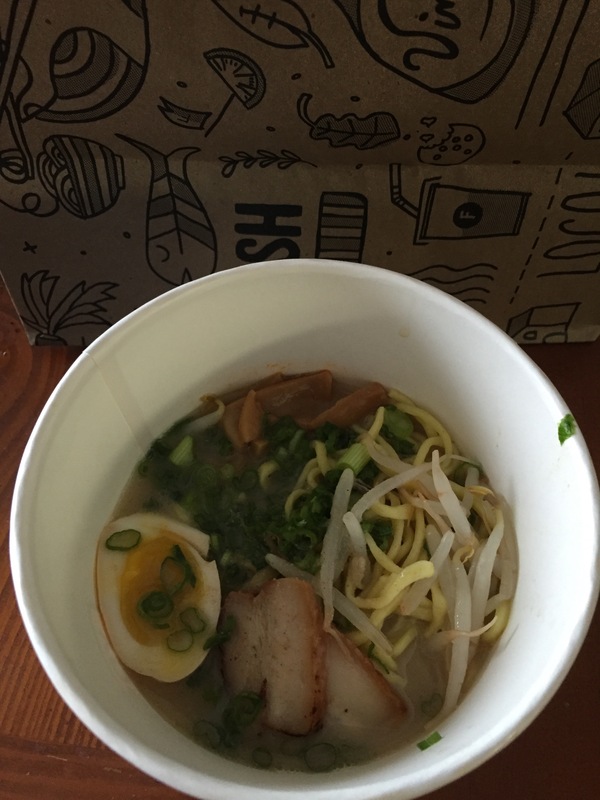 Enter the Flagship concept that by far does the best job with its take-out option.Separate container for broth, the rest of the tonkotsu ingredients including chashu (soy braised chicken or pork), menma (marinated bamboo shoots), moyashi (sprouts) and negi (green onions). At the time this also included an ajitama (soy-marinated) egg but a look at the current online menu does not include this inclusion cost-free. I also added a side of korean spicy wings because I’m a glutton for punishment. The ramen was delicious and impressive for being made in under 20 minutes at a mall. While I didn’t get the full experience of sitting at the small bar and slurping, the convenience of eating quality ramen on my couch sufficed. I immediately wanted more wings as well. 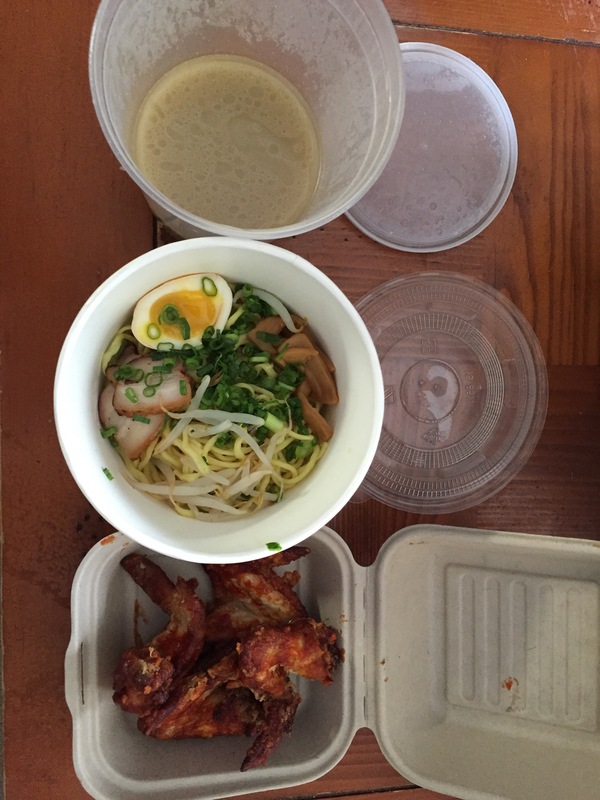 On a second visit, I opted again for take out.I tried the deluxe tonkotsu (also missing from the current online menu) which contained everything above as well as corn and bacon rayu oil made with crispy bacon and chili oil. 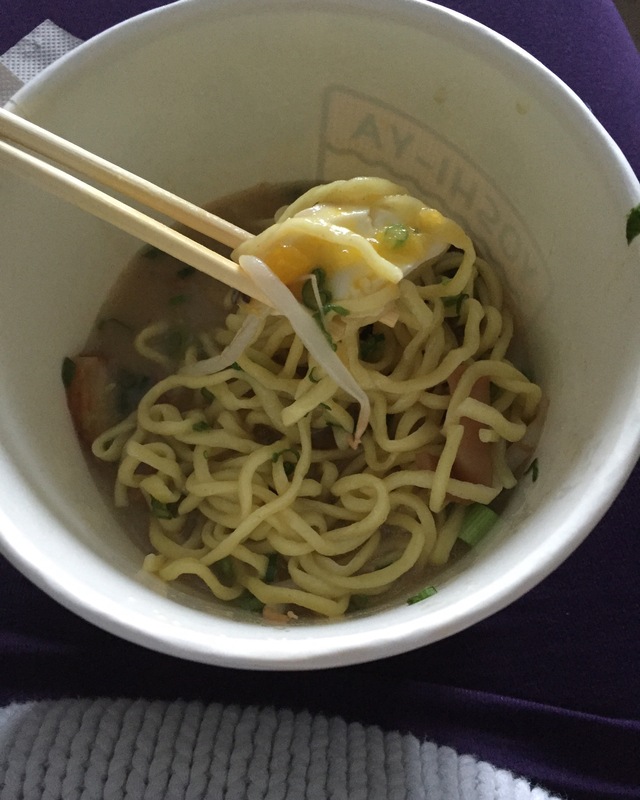 Each time my ramen was consistent, the presentation was only slightly compromised (by the nature of the difference between a bowl and a container) and flavorful. What was at first my second favorite spot at Flagship became my Number One (more on that in a bit). Over my lunch break, I decided to try FC’s call ahead option and try out Clever Greens. I like to think of myself as healthy every couple of months, so this concept fits in nicely with having a salad for lunch that didn’t skimp on flavor. I chose the Caesar by Southwest which has cotija cheese, crispy tortillas, avocado, romaine and chipotle caesar. I of course also opted for the chicken add-on. They ask you if you want light, medium or heavy on the dressing which is a nice touch along with mixing everything up in a bowl for you, allowing for even distribution of ingredients. 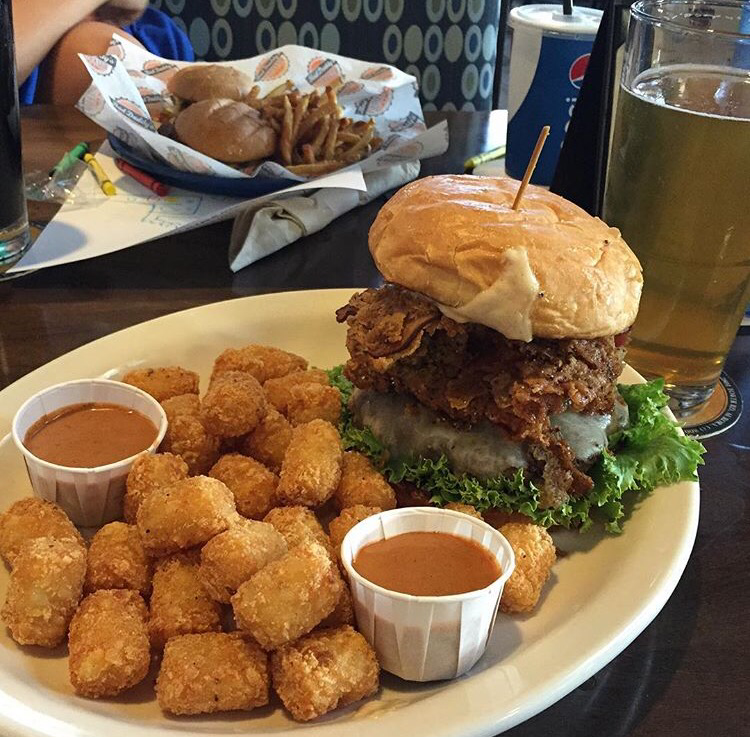 Unfortunately, calling ahead and getting this to-go only works if you live or work relatively close and plan on eating as soon as you get to your location. 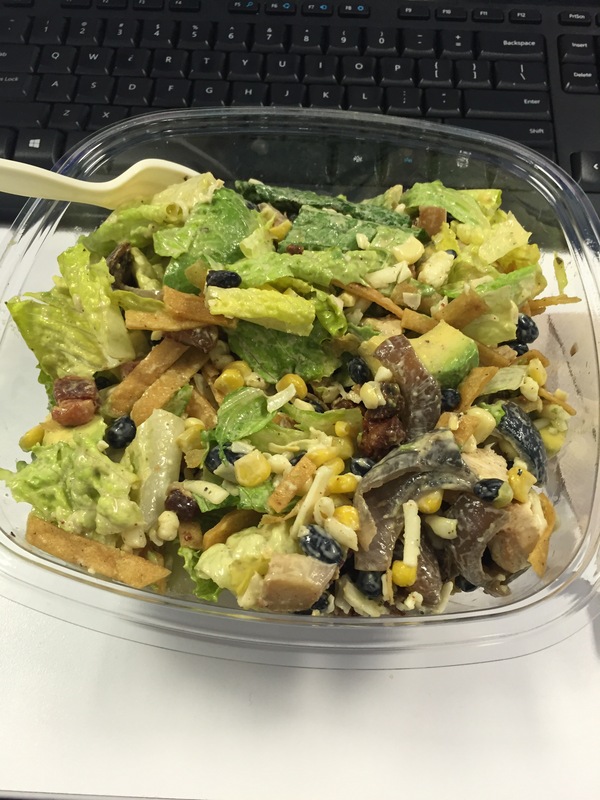 By the time I got back to work, after a quick stop at the bank and a last minute meeting, much of my salad was soggy. 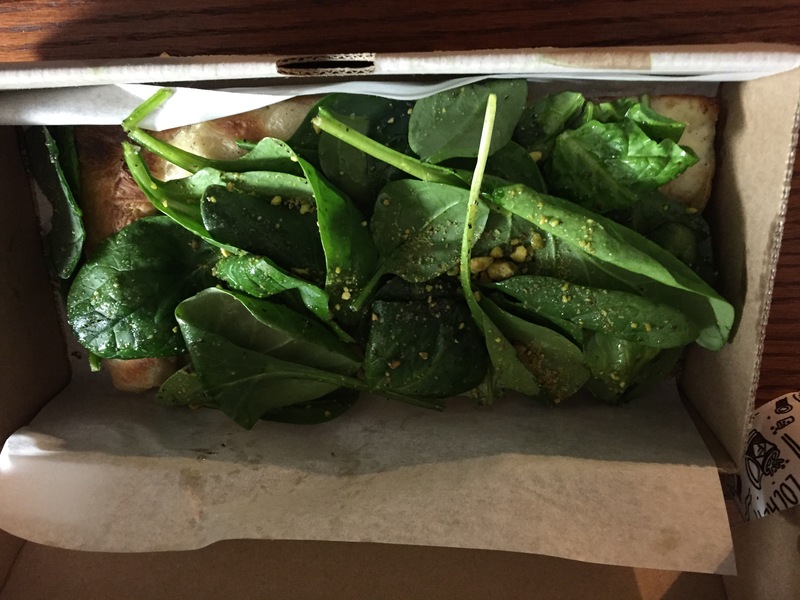 A nice touch may be to include the dressing on the side for to-go orders and letting the customer add right before consumption. 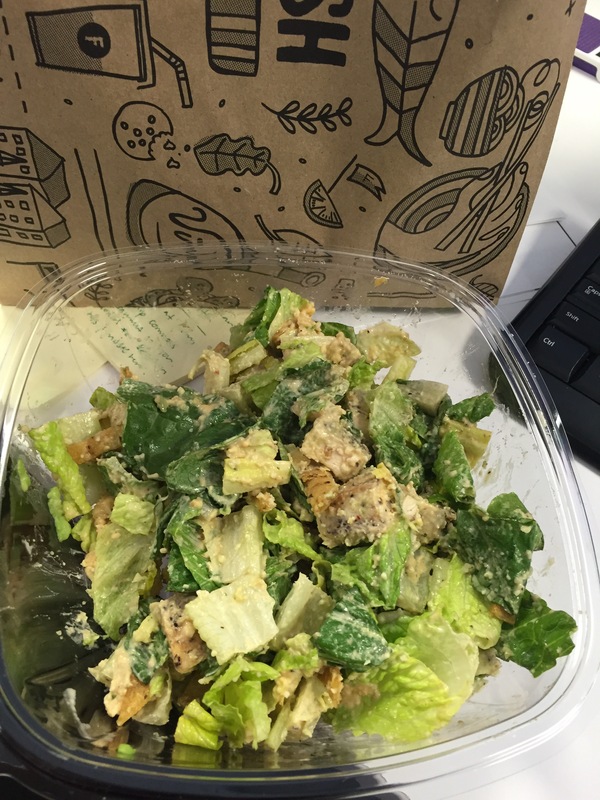 Despite my warning just now I got a salad to go again for my second visit, albeit this time better timed. I added chicken to the Baja Moment (jack cheese, crispy tortillas, sweet corn, charred red onion, avocado, romaine and tex-mex ranch) while substituting the grape tomatoes for black beans. I should have stuck with my gut and also subbed out the charred red onion as it added a weird consistency against everything else in the salad. Lots of flavor in both salads but the price point seemed just a bit much. Spending $10-12 is just a bit of a stretch when you could easily recreate each one at home. Clever Greens is heavy on convenience, which isn’t a foreign concept for the health conscience (Eat Fit Go…). Next up was Amsterdam. I’ve had their original location on my list for a while so I was excited for the extra incentive to try it out. I went with the doner kabob (beef & lamb with tabouli, pickled red cabbage and carrot chickpea salad) sandwich option and added feta fries (curry dusted with garlic, herb, spicy green and red sauces). Admittedly, I was probably setting myself up for failure with this one as I HATE chickpeas. Don’t offer me hummus and I will give you a puzzled look if you claim falafel as the next best thing. So ordering a sandwich filled with chickpea salad and cabbage was not an inspired move. 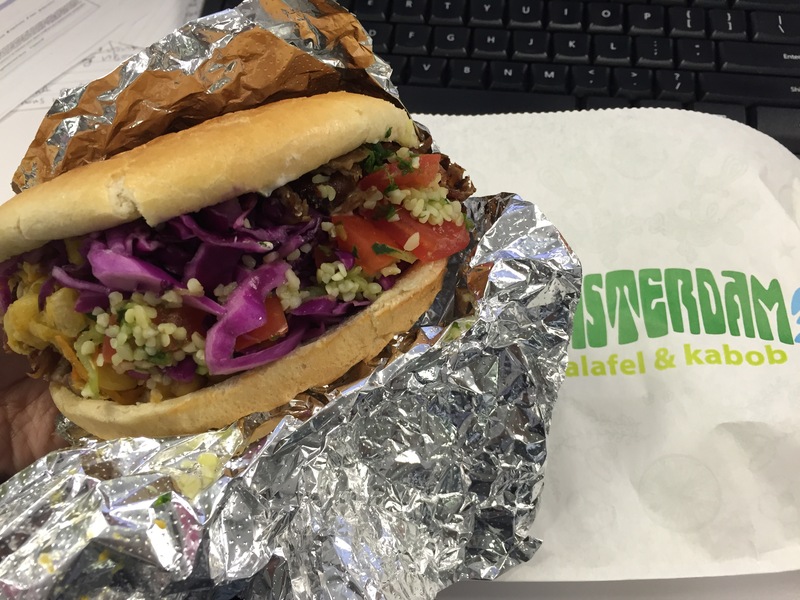 Getting past that the doner kabob was quite salty and a bit dry. I enjoyed the fries if only for the toppings; otherwise, they were pretty ordinary. 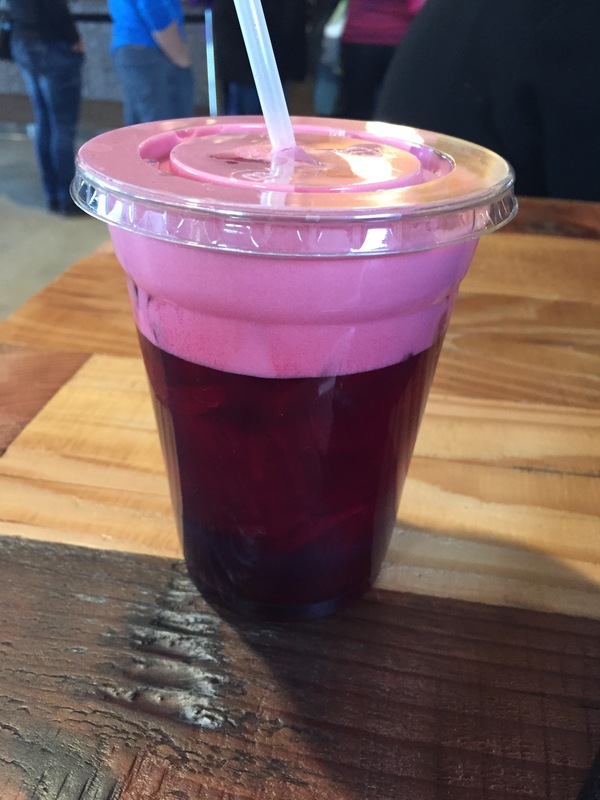 I also tried a fountain soda, made with cane sugar and healthier sounding flavors like agave vanilla cream. A new venture for Pepsi the Stubborn Soda line debuted at Flagship which is kind of a big deal. Still definitely soda but one I wouldn’t mind spoiling my no soda rule for. Next up was pizza as I again needed to grab and go. It was towards the end of the night so I didn’t have to contend with the lines I’d become accustomed to every lunch break so this visit started out promising. I ordered both The Butcher (tomato sauce, soppressata, mortadella, prosciutto, mozzarella) and the Cheesy (bechamel, cheese curd, grana padano, smoked caciocavallo). Of the two the Cheesy was my favorite. The unique blend of cheeses lent a certain depth to the slice. 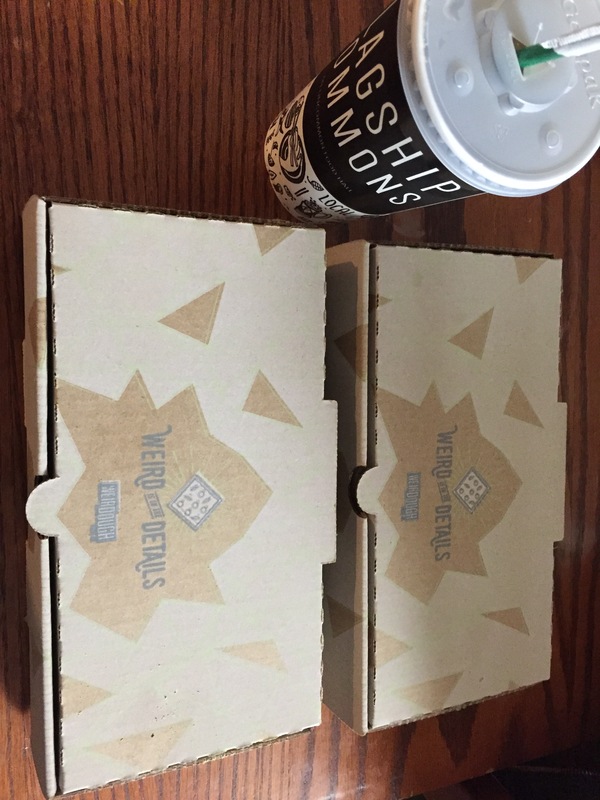 I loved the crust for both pizzas but it was not as tasty cold as some slices I’ve had and did not re-heat super well. I definitely visited Juan Taco the most out of the Flagship concepts. Mainly because I love Mexican food and partially because of my initial experience with the fish taco. Make no mistake, a meal here is pricey (par for the course) but you aren’t getting a #4 from Taco Bell. 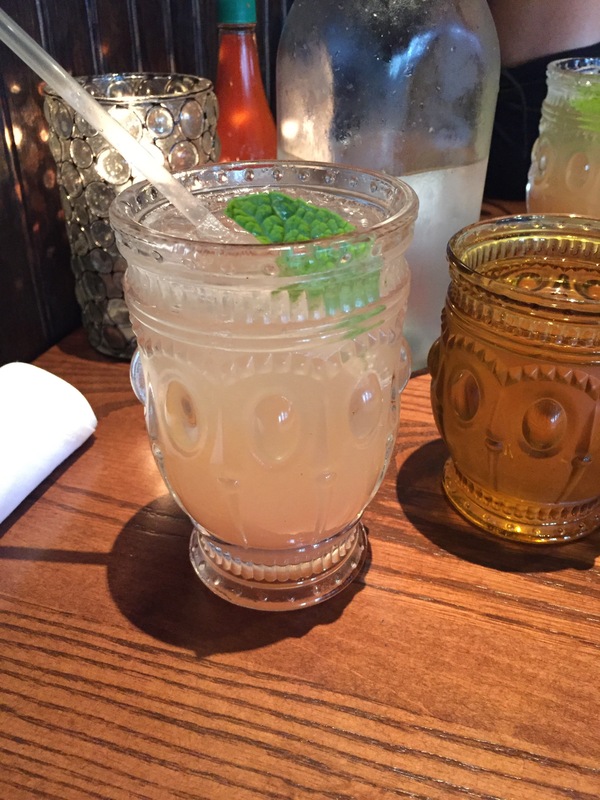 Refreshing Aguas Frescas, a killer margarita, delicious fried chicken skins with chipotle mayo (which appear to no longer be on the menu) and a phenomenal fish tacos are among my favorite foods I’ve tried at Flagship. My only qualm, and why I can’t place Juan in the number one spot is the inconsistent experience I’ve had with the fish tacos. 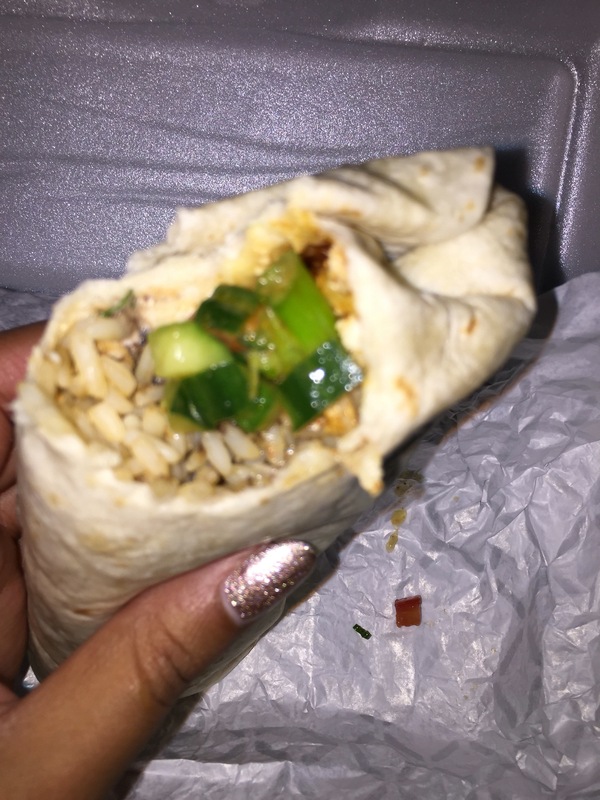 The first time it was delicious and in the running for a better deal than MULA’s. The second time they were alright, still flavorful and with a nice amount of chipotle mayo. A third time the cabbage slaw was chopped so roughly I had to take most of it out to get an enjoyable bite and the most recent time the entire presentation was a bit off, making it the messiest taco I’ve ever eaten. 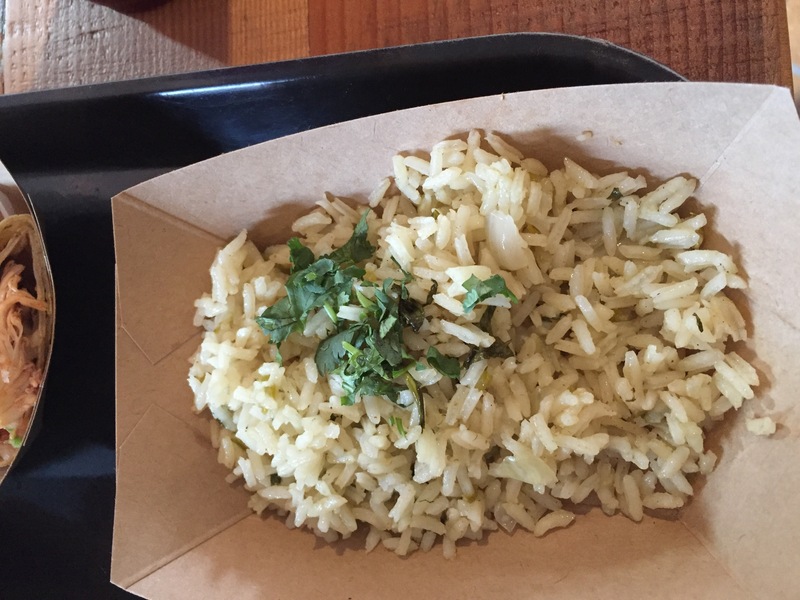 An order of charro beans and green chile rice didn’t impress – lacking any kick or spice as one would expect from something with green chile present. 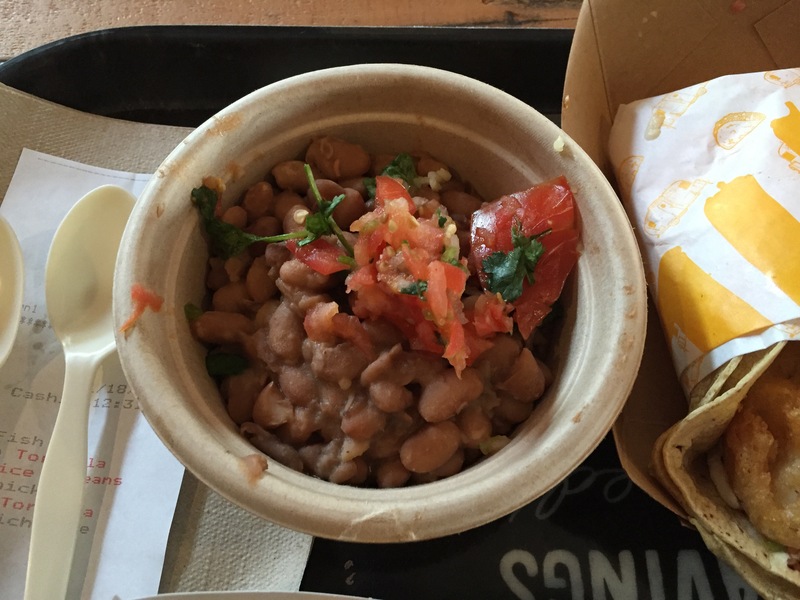 A carnitas tacos had tender meat but a weird overall experience with the presence of beans. Again, if you get anything here, try a fish taco and get a fresca or margarita and definitely stay to eat (these tacos do not travel very well very far). Blatt is the only concept here with the option for full service so I decided to try it on a slower Thursday. The “interior” matches their other locations almost perfectly and there is an outdoor patio. 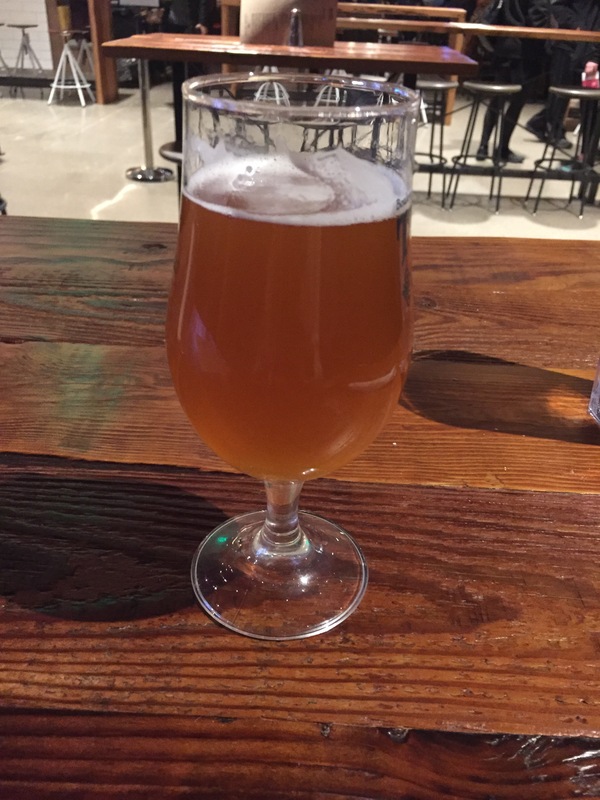 I started with a Blonde Fatale and decided to order a Blatt Burger as it was one of the few items I hadn’t tried on the menu. I’m normally quite picky but reined it in this time, only asking them to take off the tomato and pickles while giving me the Guinness-braised onions on the side and paying extra for the aged white cheddar (because I don’t eat plain hamburgers by choice). Clearly, my perception of this being a slower night was not shared by my server. 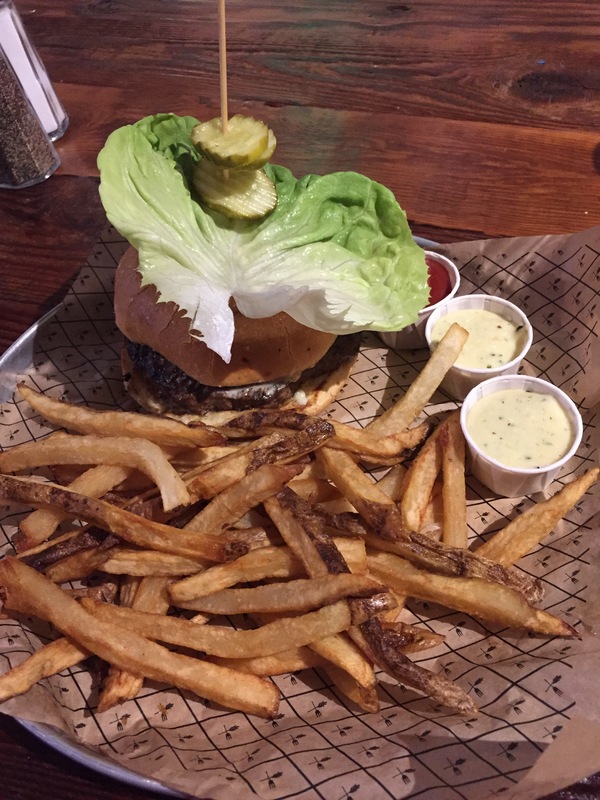 After waiting forever just to get a beer ordered she then had to “fix” my order three times, the first time occurring because my burger had pickles. Then there were no onions on the side and no white cheddar which I added when ordering. There were maybe four other couples or people there so the “full-service” experience was a little bothersome but the burger was good and the beer was cold. I saved Yum Roll for last as I am not really a huge fan of Blue Sushi. It’s obvious that a food hall owned by Flagship would include their own existing concepts like Blue and Blatt so I tried to be a bit more optimist than I normally would be. 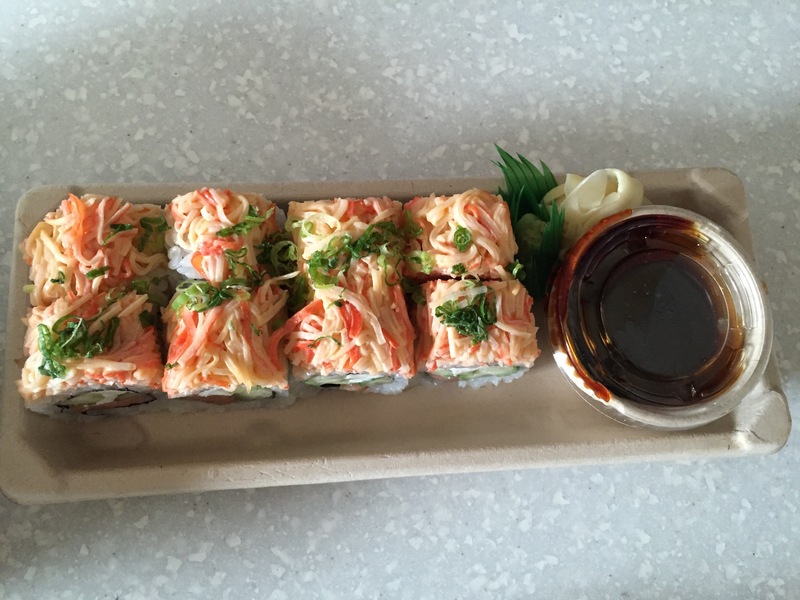 I decided to try one safe thing that I knew I loved (itchy salmon) and branch out into a new roll and a Yum-Yum bowl. While waiting for my food to be prepared I also had a quick drink at The Bar. 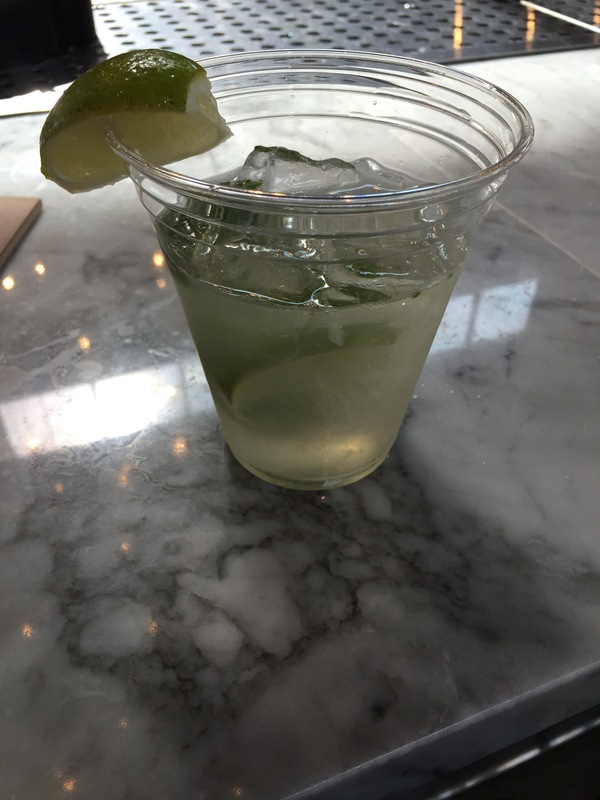 The bartender made my mojito simply enough and even transferred it to a plastic cup when I told her I didn’t know how long my food was going to take. Wasn’t the fanciest or strongest drink I’ve ever tried but we also are in the middle of a mall. For $7 however, I’d recommend just getting a margarita from Juan or a drink at Blatt that packs a bit more punch. 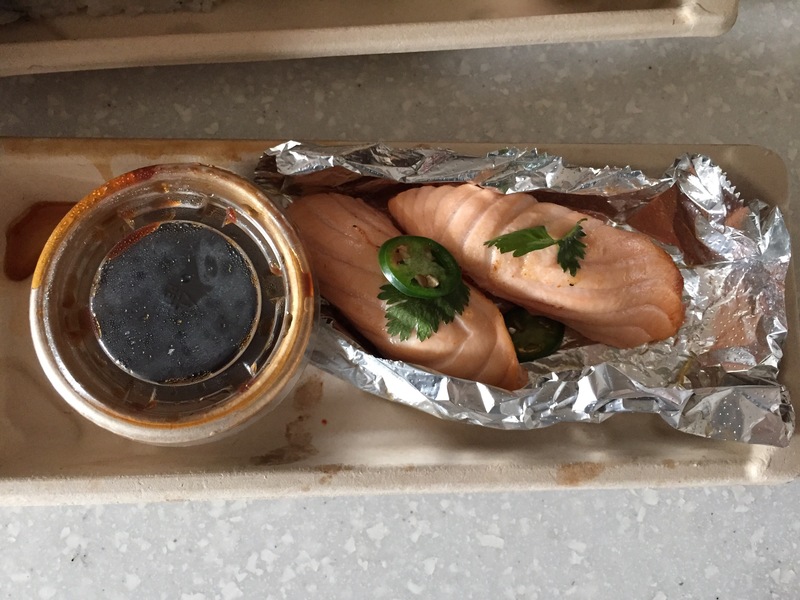 The Philly Bomb I tried was good – great presentation, fresh and made quickly. It’s an interesting experience to watch the sushi chefs making various rolls as passer byers look on in amusement or puzzlement. 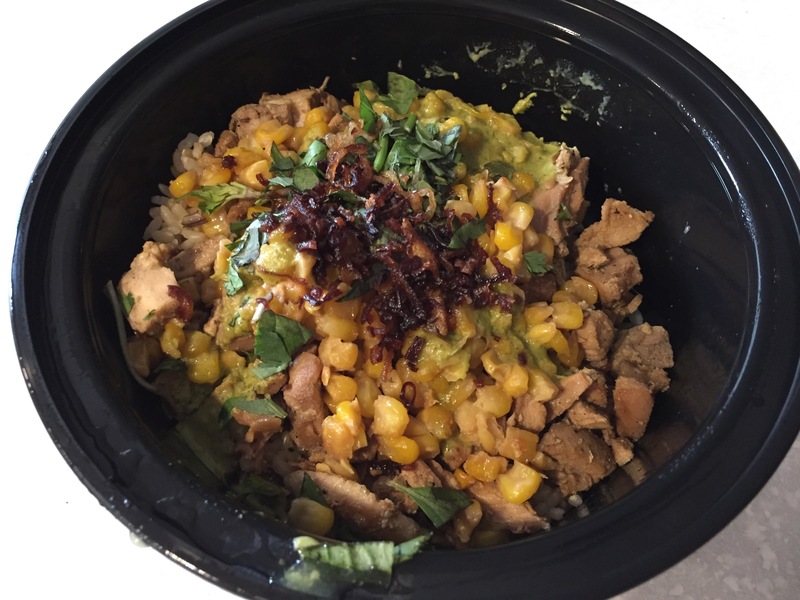 My yum-yum bowl containing brown rice, lemongrass chicken, charred miso butter corn and green curry with cilantro + thai basil and fried shallots was enjoyable. I was expecting a bit more flavor from all the toppings I selected and for it to be a little less dry. Reminded me of an Asian version of Chipotle’s bowl (which I also think is overrated but whatevs). Overall, Flagship Commons is a great concept. I love the option to get something other than chicken fingers at the mall and the design of the space is great. But many of the concepts are just a little too safe or not as well executed as some would expect, especially considering the price points of each. It begs the question of who is Flagship’s real audience. If it’s run of the mill mall-goers some big considerations need to be made around adjusting attitudes around mall food price points. If they are looking to attract people like me, who don’t really care about the mall but would like a decent fish tacos when in the vicinity, consistency and quality needs to be a focus. In the end, Flagship hasn’t reached destination status for me. Outside of this article, I wouldn’t see myself going out of my way for any of the food. But I’m interested in seeing their growth and recognize that they are looking at new ways to attract a more invested crowd such as their Happy Hour, Vegan Thursdays, Friday Night Concert Series and the upcoming Patio Days at their Blatt full-service section and outdoor patio. People work on their relationships in many ways. We do it with #daddinners. Some kids have cherished memories with their dad like Christmas morning. I have cherished memories of my dad in restaurants. My love of food in many ways should be contributed to my father and I’ve recently realised I don’t give him that credit enough. While my love of cooking and the kitchen being my favorite place comes from my mother and NaNa, undoubtedly my willingness to try new foods at new restaurants was inherited from my father. #daddinners were the first instances of me realizing how much I show my love through food. It became an obsession to always pick a restaurant or order the thing that would start a conversation because so often I was too shy to talk about real things and real feelings. Feelings I’ve only recently begun to acknowledge. My parents divorced when I was small. So small that I don’t have any memories of them actually being together. But I was fortunate enough to still have my Dad in my life. It wasn’t perfect, I didn’t get to see him every day like most of my friends but I knew he was there for me. Then … we moved to Nebraska. And so began the official start of Dad dinners. We’d go to dinner whenever one of us was in town as we normally only got to see each other for a few hours. Occasionally I’d visit for longer with the express purpose of staying with him, but at some point, there was still a dad dinner. As I grew older and our relationship (and my feelings about it) grew more complicated, there was one thing that was always easy – dad dinners. I’ve come to terms with the fact that my relationship with my dad will always be different than that of my younger brothers and youngest sister, but I’ve also realized that isn’t the end of the world. I’m a better food critic because of dad dinners. I have a more extensive palate because of dad dinners. 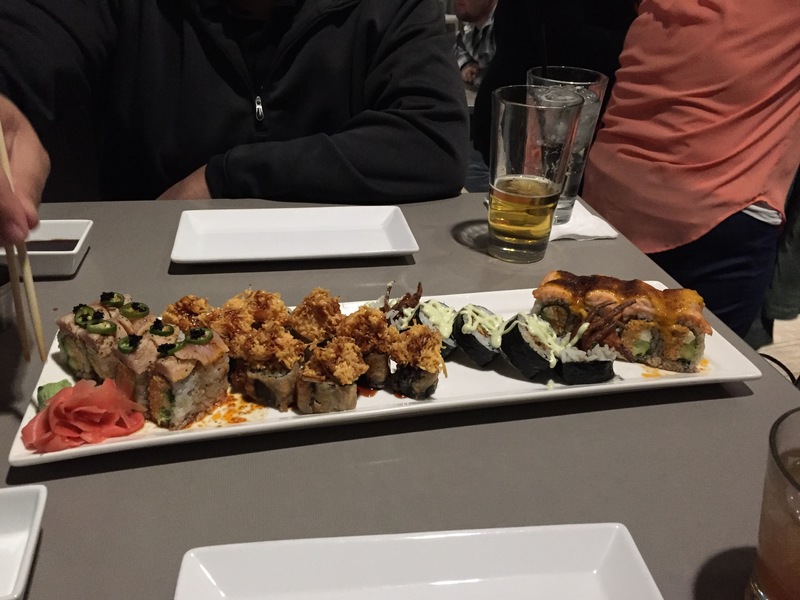 I believe in ordering appetizers because of dad dinners. But most importantly, I’ll always have #daddinners. Before I can dive into the greatness my recent trip to the DMV area was I have to reflect a bit on the absence of posts to ashleyraeturner.com. I like many “bloggers” have had more than one. I start with such gusto and then …. well things just happen. The Universe doesn’t care about my plans to more seriously food write. It laughs because I thought starting grad school (Go Boilermakers! ), working full-time (with increased responsibilities and a raise to boot), moving to a new apartment (and moving my mom back home to Colorado) and saying yes to every “extracurricular” possible would still leave me time to write both here and in Omaha’s locally owned Black-paper. Clearly I was incorrect, or at least incorrect for a few months. This post serves two purposes. The first of course is to take you on the food journey I attempt to have every time I travel, but the second is to remind me why I wanted this site in the first place. Why people ask me about places to eat or things to make. 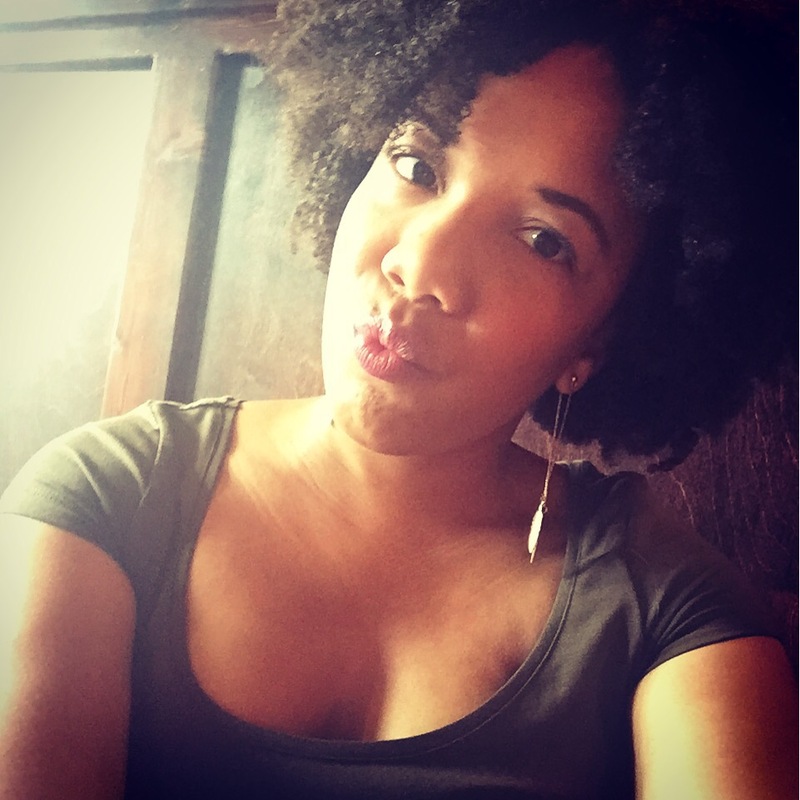 It reminds me that while I probably need to have a Year of No (I know this isn’t quite what you were thinking Shonda), I need to not say no to the things that fill my heart and that I’m truly gifted at. Now that sappy emotion time is over let’s get into it lol. When a friend asked if I would be interested in going to a networking conference a few months ago I was at once curious (networking conference = sell me things I can’t afford) and totally with it (I love DC). A couple hundred dollars later (including a hefty bill to board my doggy baby) I was rushing to catch my Southwest flight (which ended up being the same one as my friends .. no we did not know that until I stepped on board .. a minute before the closed the doors). Quick #shoutout to Southwest because my boss flies them so much I can normally get a free drink coupon out of her, and two free checked bags comes in handy, and I don’t always care about having an assigned seat and they fly most places I want to go. We touched down at DCA and after an interesting Uber ride, checked into the Gaylord National Resort on the National Harbor. This.Place.Is.HUGE. Our room overlooked the atrium that had four different restaurants, a lobby bar and tiny houses. It was a bit overwhelming so after we checked into the conference we headed across the street to Public House for some food during their HH. Blame it on the jet lag or on being super hungry but I forgot to take pictures of my food ._. We both started with a half priced well (their bourbon well was Jim so I was satisfied) and I ordered the cheesesteak spring rolls and the chicken quesadilla. I didn’t love the spring roll due to the lack of cheesiness I expect with a cheesesteak but the quesadilla was quite good. I tasted a bit of Christen’s crab & artichoke dip which was pretty meh. The service wasn’t super great but we definitely noticed Public House was the place to be for the 21-30 crowd so we got some people watching in. After a quick nap and homework break, we decided to venture back out and walked another block over to try The Tasting Room. 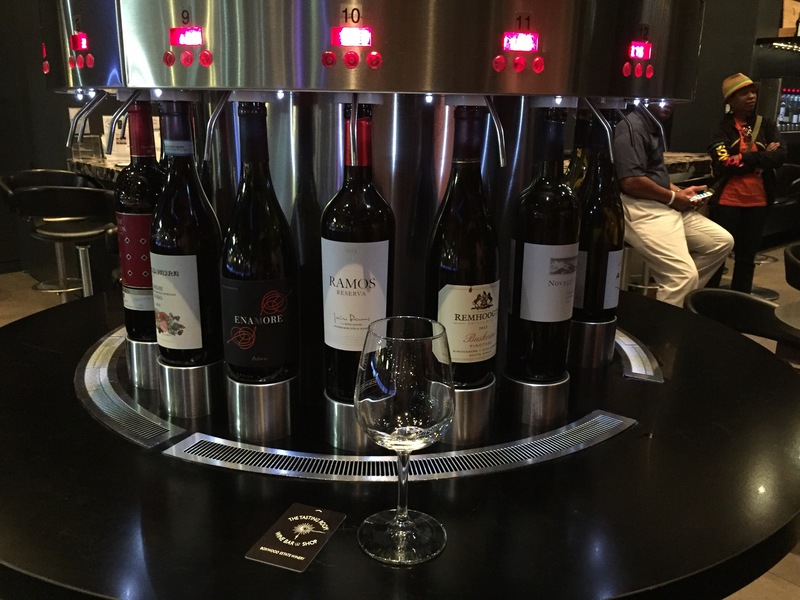 Immediately we made a comparison to Brix in Omaha as they had little wine tasting machines. You load money onto a card and taste away. We tried a couple and then both got a glass of wine. I tried the Boxwood Rose which was very good and not too dry. They had a special of $10 off to go wines so we took a bottle back to the hotel and called it a night. After a day of conference stuff, we needed a place to eat. 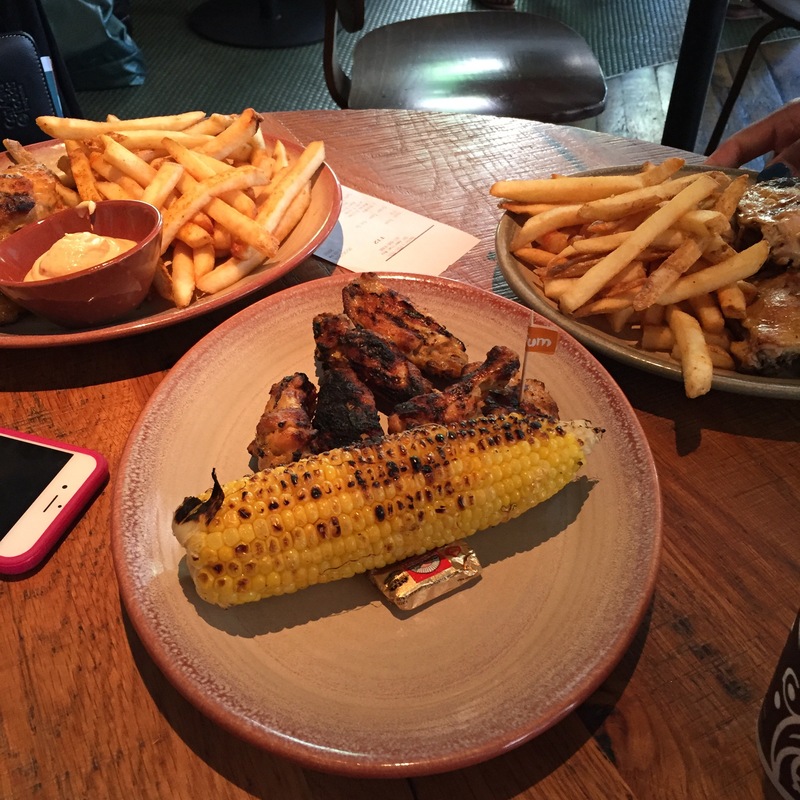 After a bit of a run around part of our group ended up a Nando’s Peri Peri. This place was on my list of things to eat and our Uber driver the day before recommended it so we came in with high expectations. I ordered the Chicken burger (hot) with chips and got their new blood orange lemonade. Literally everything was perfect. The chicken breast was juicy and the pineapple complemented the spiciness of the marinade. My lemonade was refreshing but I would have liked the “chips” to be a little crisper. 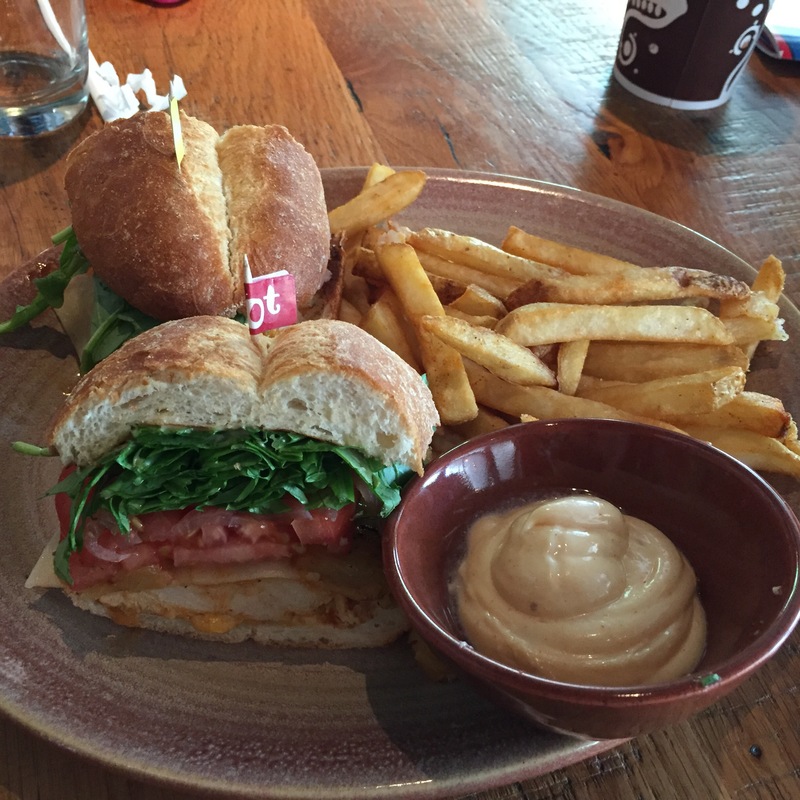 My lunchmates all agreed we had made the right choice with Nando’s. Later for dinner we stopped by Succotash, another restaurant I had researched beforehand. This may have been the place I was most excited to try because I love southern food and many places are doing great things with the southern/asian fusion concept. 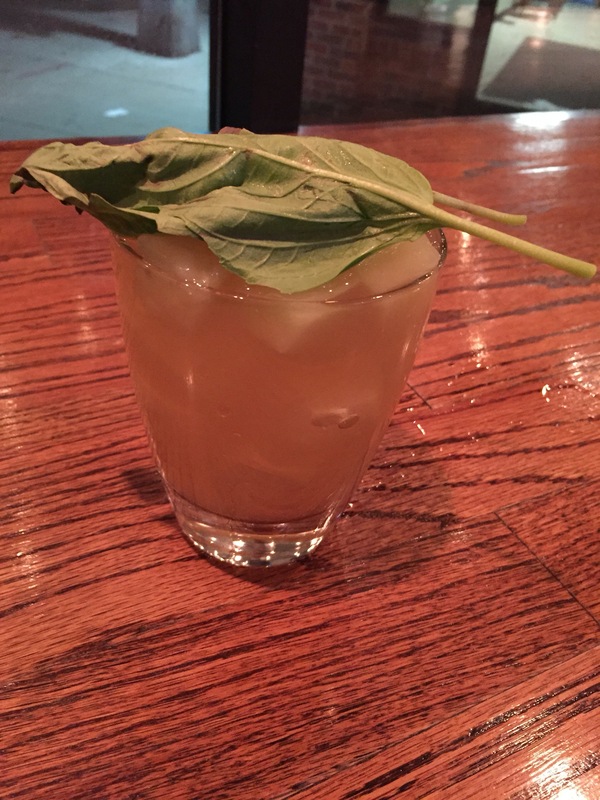 We started out with the Belle’s Punch, though we were hesitant to combine Vodka, Bourbon and Champagne. Our waiter assured us we wouldn’t die so we proceeded. I wanted to try a little bit of everything so I ordered the crispy local blue catfish, bacon mac n cheese, cheddar bay biscuits and tried my friend’s crispy brussels sprouts. Catfish – I liked the mint aioli and the char on the lemon lent a bit of smokiness to it. The fish was fresh and crisp but I did have some pieces that seemed a little underdone (I saw some red). 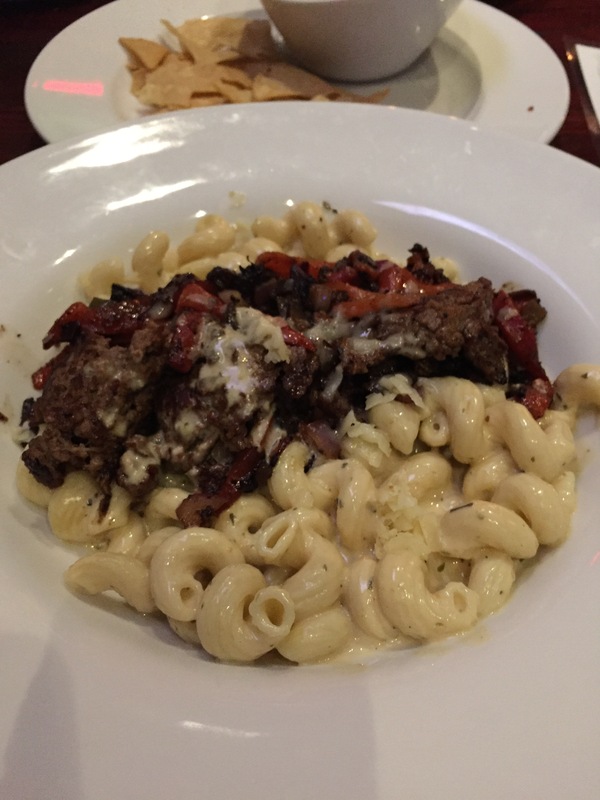 Mac n cheese – overall I liked this dish. Once you got past the exterior though the actual bechamel sauce didn’t have a lot of cheese in it; but the dish wasn’t dry so I got over it. Biscuits – So this may have been the most disappointing dish of the night. You could tell there was cheddar on the top of the biscuits, but cheese seemed to be missing in the interior. They weren’t super fluffy and crumbled a bit which isn’t the worst thing and the black pepper butter was a nice touch. Brussels sprouts – These were okay. I liked the char on them but wouldn’t eat the whole bowl. Will probably never get over my disdain for brussels sprouts. C got the shrimp and grits which came with a fried egg. It had a brown gravy which she found a little weird but she enjoyed it overall. We came back to Public House that night and were greeted by a slightly different scene. 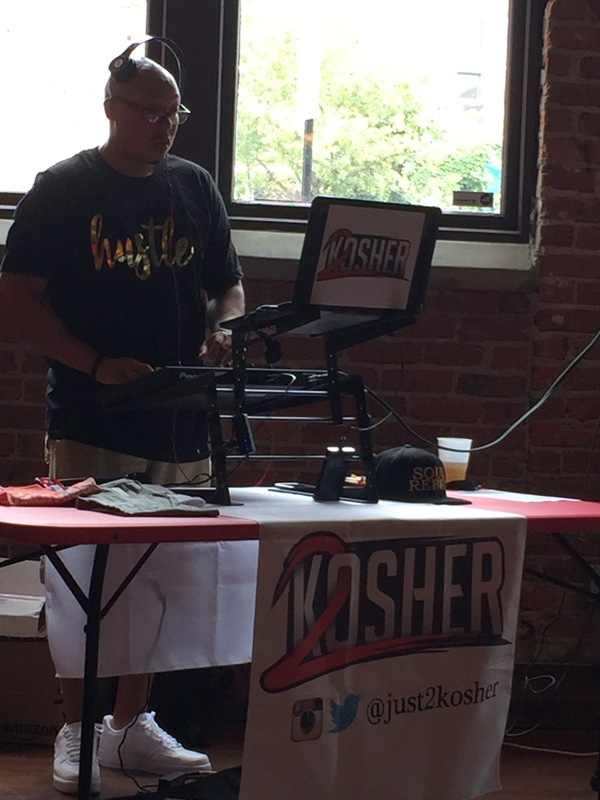 A live DJ played trap music and rap while people filtered in to get late night drinks. C ended up taking one for the team so our three or four drinks each were free on top of a tequila shot (which is something you can’t escape taking while with C). Friday was a full day of conference stuff and a luncheon so outside of a quick stop at the outlet mall we stayed in the hotel. That night we decided to venture out into neighboring Old Town Alexandria to try Don Taco. Their Facebook page looked like what taco dreams are made of so we were both looking forward to the experience. We shared an order of white queso fundo and guacamole. I enjoyed the queso though I think more of melted stringy cheese when talking about fundo and not straight up queso. Would have loved some spice in this from peppers or even some chorizo. The guacamole was super fresh and a medium chunky consistency. 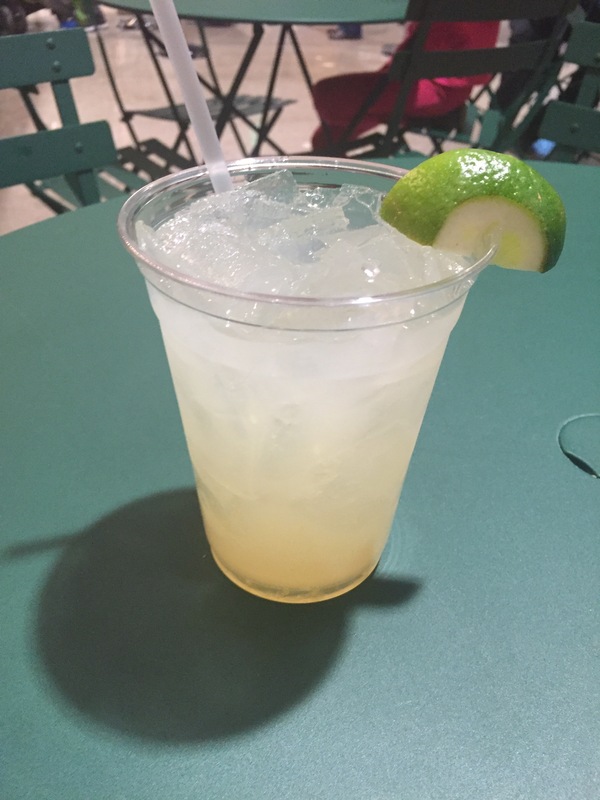 I started off with the Mexican mule which was delicious and made me forget I was drinking tequila (almost). The combination of the tequila, ginger, lime, bubbles and bitters created a good flavor profile. 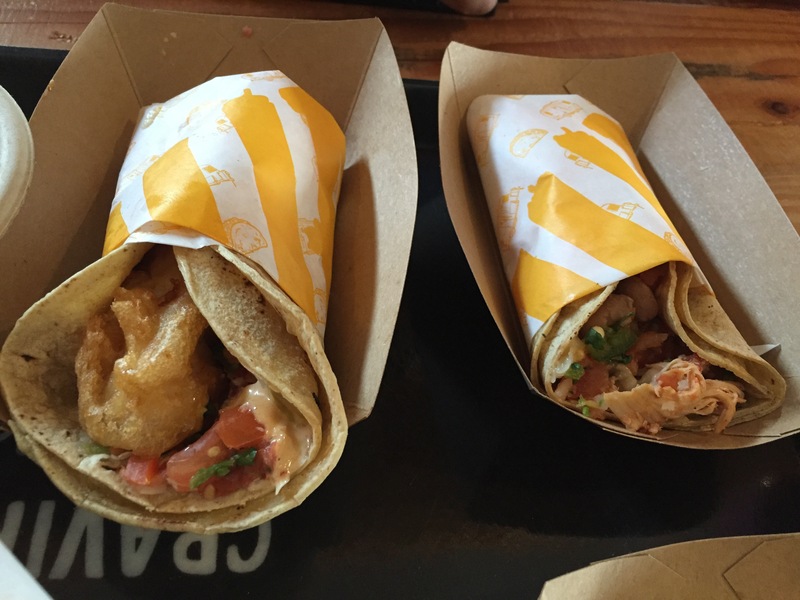 I tried three tacos: California roll, surf and turf and pomegranate glazed skirt steak along with a chicken empanada. The surf and turf and skirt steak tacos were PHENOMENAL. The steak on both was super tender and flavorful. I griped slightly that the surf and turf only had one shrimp but I loved the steak so whatevs. The California roll, on the other hand, was not a winner. I blame this on myself for getting too adventurous in thinking sushi roll ingredients would be a taco I would like. The fish was fresh and it had avocado, but it was the blandest of the trio. Points for creativity but the execution was ehh. The crust on the empanada was sufficiently flaky and crisp. The chicken was tender but there wasn’t a big kick of flavors that I was expecting for some reason. Still a super filling and worthwhile choice on their menu. 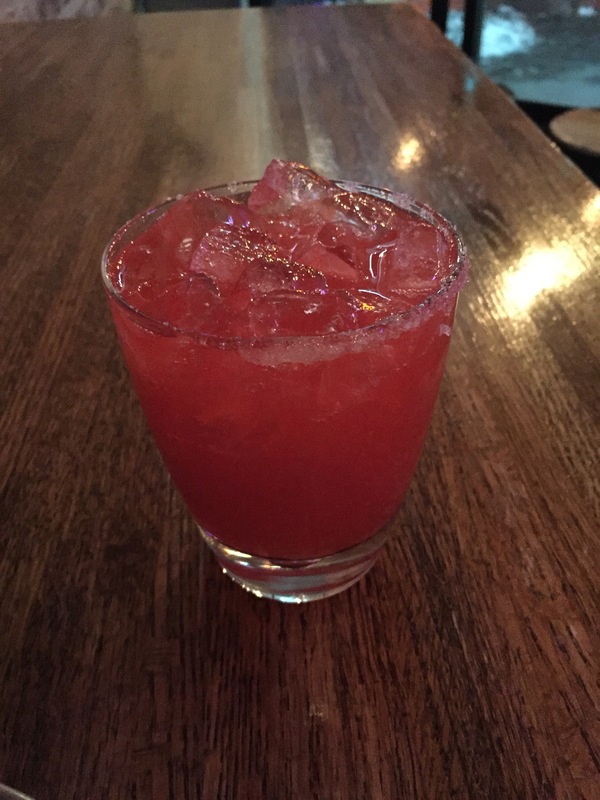 I also tried a Carlito’s Way (because how could I not, that movie is great) which had agave nectar and grapefruit bitters. 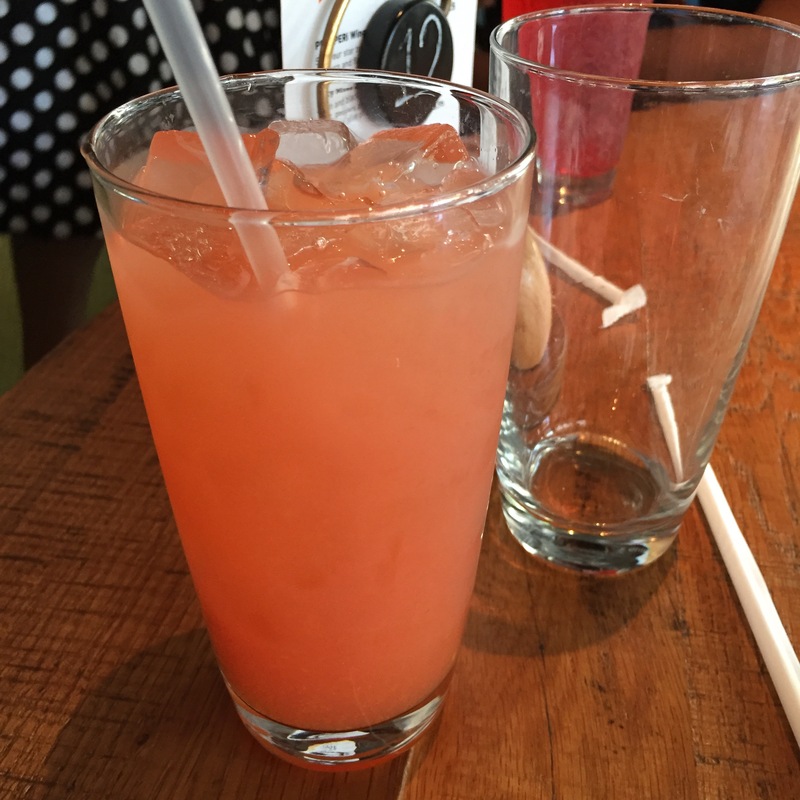 Generally, I don’t like grapefruit drinks but I enjoyed the bitters in this and was very satisfied with the drink’s finish. 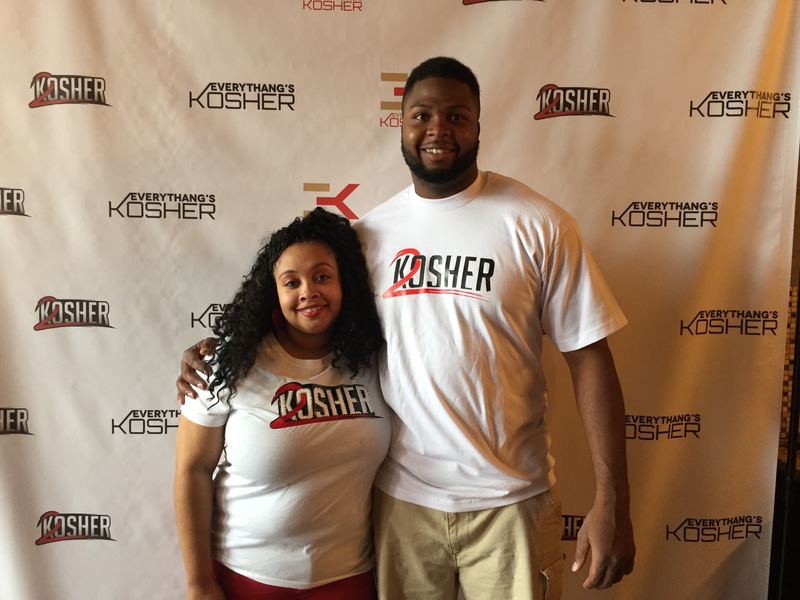 It was our last full day in the DMV with lots on the conference agenda. We grabbed a quick dinner at Crab Cake Cafe which is fast casual before going to the closing party. I ordered the Crab melt which came on an English muffin with melted cheddar. I asked for a side of their remoulade and ordered an Old Bay Cheddar Corn Muffin. My gosh was this crab cake tender and juicy with more meat than filler. The muffin was really good, despite the lack of cheese, which in this case was okay. After the 30 or so minutes we spent at the closing “yacht” part we headed into D.C. to do U Street. We danced, we drank and we made some new friends. At the end of the night, I was hungry of course and the line for &pizza was too long so we headed to Ben’s Chili Bowl instead. 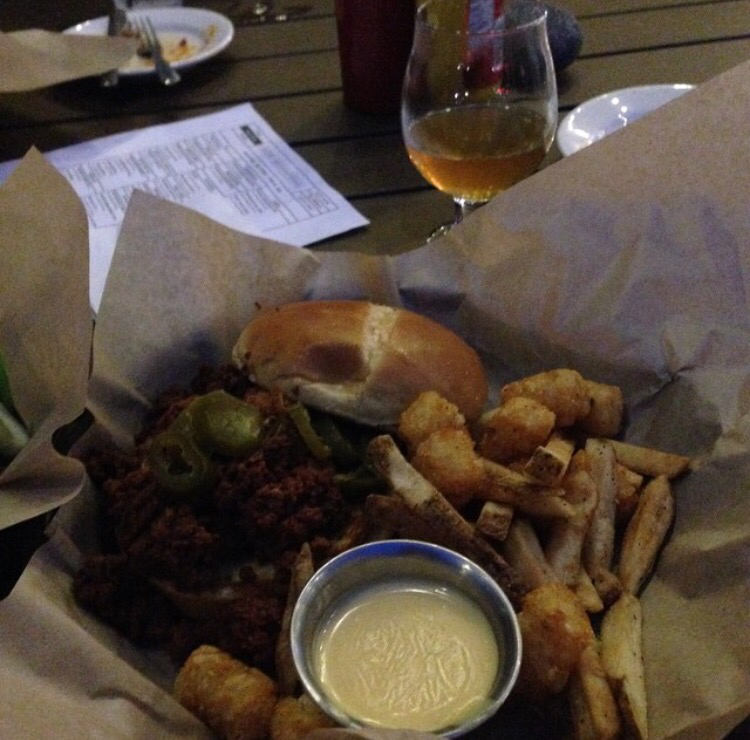 I got a chili burger with a side of cheese fries I never finished. 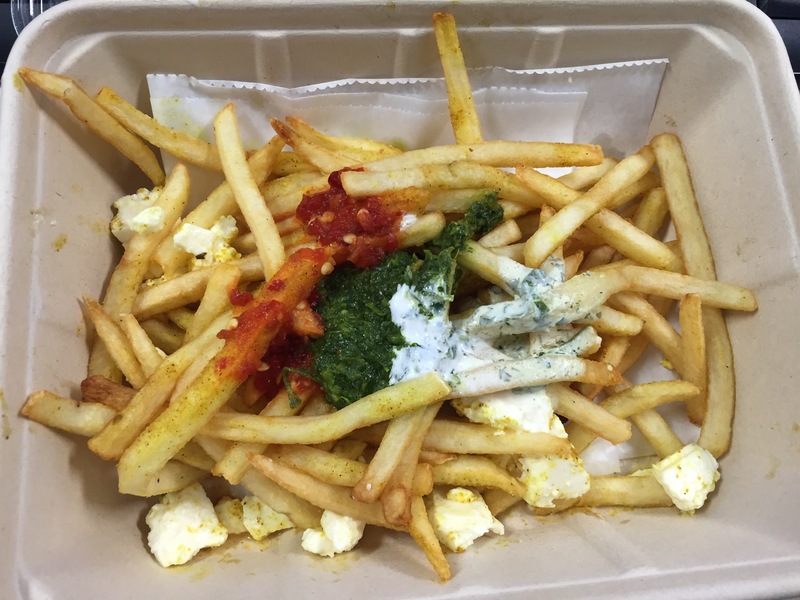 It was the perfect drunk food – greasy and cheesy. I wish there was an option for spicy chili but other than that this D.C. food institution is good in my book. I had a couple of hours to spare before my flight left so I meet a friend in the Navy Yard at Scarlet Oak for brunch. 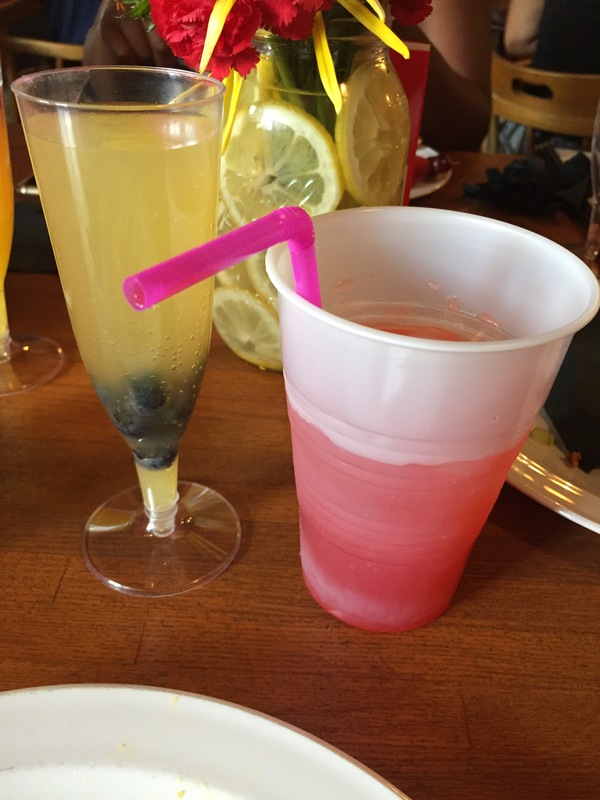 Of course, I went with the bottomless mimosas; that’s what you do in D.C. before a 2-hour flight. I went with the fried chicken benedict with a side of fruit to prove I was a paragon of health and wellness. I was very excited that it was mostly strawberries and pineapples as I hate cantaloupe. The roasted potatoes were done well but needed a bit of flavor so I asked for hot sauce. The fried chicken breast was great; juicy inside, crispy outside and the right thickness as to not be overwhelming to the English muffin. I would have liked them to have a spicy hollandaise with this but overall a tasty option for brunch. As always I enjoyed everything I ate during my visit and have added probably four or five additional places to try out the next time I’m feeling a trip to the “East Coast” (let’s face it though, the DMV is basically also the south). I love Mexican food. I believe #TacoTuesday should be celebrated AT LEAST every other week. I add verde salsa and tortillas to most breakfasts that involve eggs and I could never turn down a margarita. So when Yelp Omaha decided to have a tequila tasting at MULA Mexican Kitchen & Tequileria I had to go. Luckily I made the cut (Yelp Omaha events are very competitive thanks to Will cultivating such a great group of people) and my friend and I headed to The Blackstone District on a Wednesday. We arrived to a beautiful spread of salsas, guacamole and MULA’s signature margarita. One of my favorite in Omaha, it is very straight to the point. Not syrupy, not super sweet and you can tell it was made fresh. While we enjoyed our margaritas, chips and dips Michael J Sanchez, owner of Maria’s in Ralston and MULA, laid some truly impressive knowledge on us. I’m a learner and while I veer towards the dark spectrum of liquor I can truly say after this tasting I can throw my hat in the ring with 80% of the tequila drinkers in Omaha. So authentic and extensive of a tequila program MULA has (employees are certified by the council over approval of all tequilas) they make drinking it a true experience. Here are a few freebies I’ll give you (but really. You should go into MULA and take a class. Worth the time and moola). Think you can make tequila yourself? Wrong. Tequila can only be grown in five Mexican states. Think Jose Gold is Jose Silver’s “older” big brother? Think again. Jose is actually a mixto and the gold gets its color from dye, not age. At this point, I’m going to get to the actual tasting of the tequila since many of you probably aren’t a history nerd like me. We got to try three Casa de Centinela tequilas; a blanco, reposado and anejo. First the blanco, what most people drink in margaritas or take shots of at the bar. Also known as my least favorite tequila unless in a margarita. Only aged up to 60 days, blancos are the straight tequila/alcoholy option always. I will give it to Centinela as this blanco was very crisp and sweeter than most tequila’s I’ve had to drink before. It was fragrant with defined notes of star anise. Next, the reposado. Aged between two months and a year, this particular tequila is aged in white oak bourbon barrels. This had a more smooth finish with notes of honey. It was also slightly smoky. My uncontested favorite of the night was the anejo. Aged up to three years, it is the closest in the bunch to a bourbon (extra anejo would be the real winner in this battle though, aged more than three years but no more than five). With an oaky flavor, this anejo had notes of vanilla and pepper. An earthy tequila that can be used as a substitute in traditional bourbon drinks. 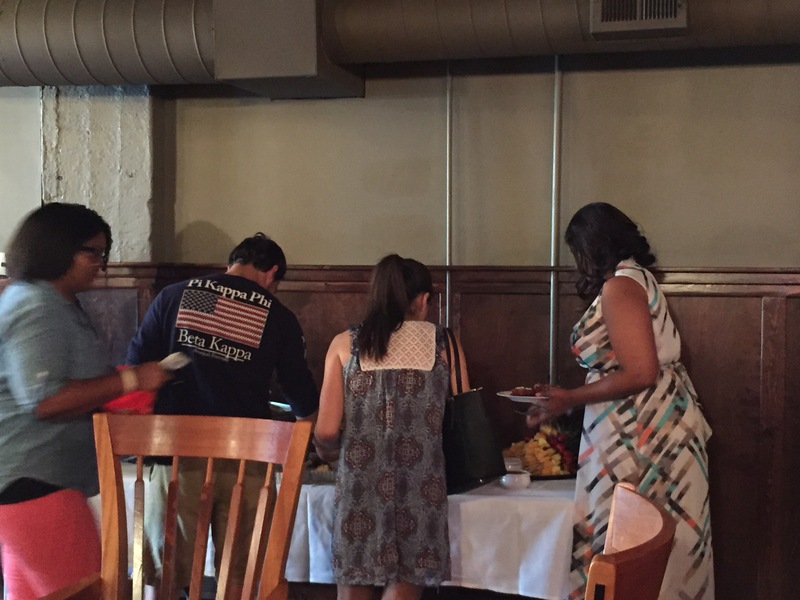 Thanks again to Will of Yelp Omaha and everyone who participated in Tequila 101. 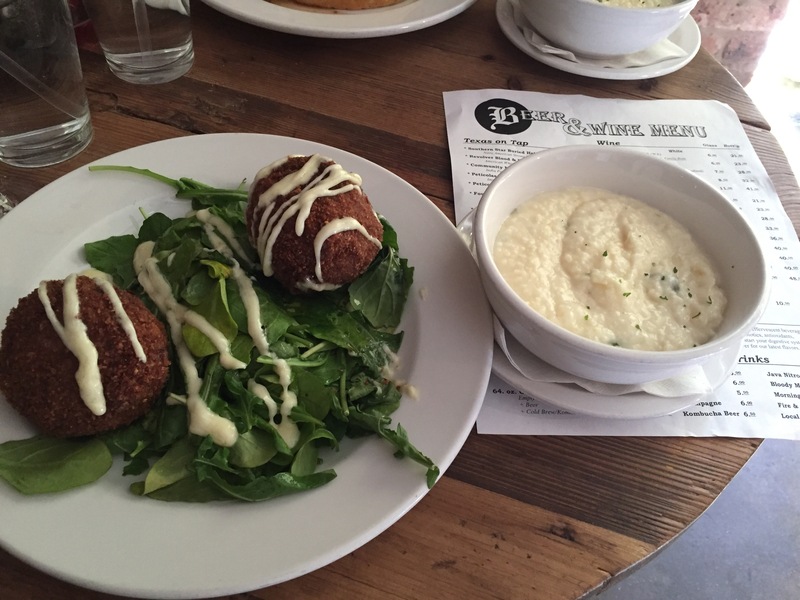 MULA is truly a Midtown/Blackstone gem that I can’t wait to visit more once I move next month. Check their Instagram or Facebook for new weekly specials and brunch (!) starting April 3. I began and ended the first month of 2016 in Texas. Partially because of fondness, mainly out of a commitment to travel more (so I can eat more; which should lead to writing more). Here are the foods (many new, some old favorites) that promise many more Texas trips for ashleyraeturner.com. To start, I met a friend who is simultaneously the worst person but the best at finding really good food to eat. He recommended Sissy’s and told me not to waste my time with anything but the fried chicken to start. 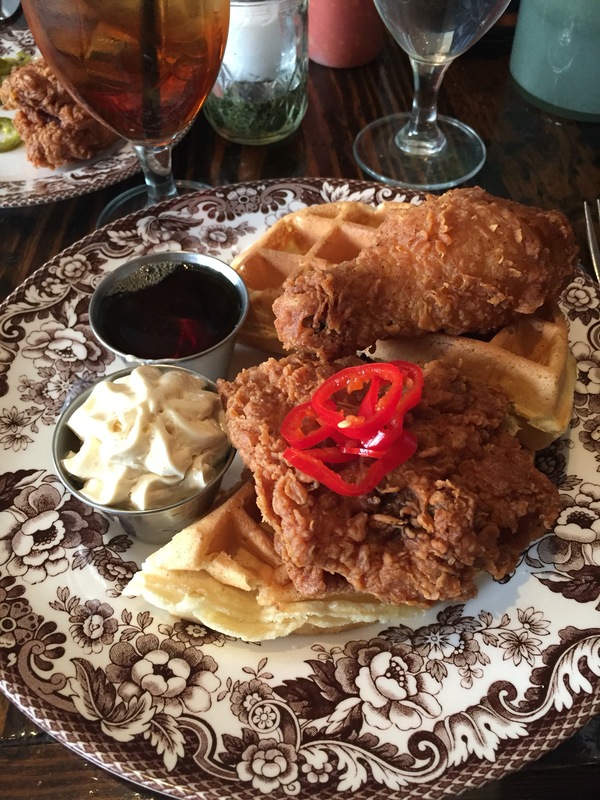 Chicken and waffles (dark meat) it had to be then with sweet tea and a side of mac & cheese to share. The brined and pressure fried chicken was at once moist and juicy with the prerequisite crispy exterior. Would have liked a bit more pronounced flavor but sometimes, chicken just needs to be freshly fried chicken. The waffle was sufficiently fluffy and held it’s own against the chicken, butter syrup barrage I put it through. 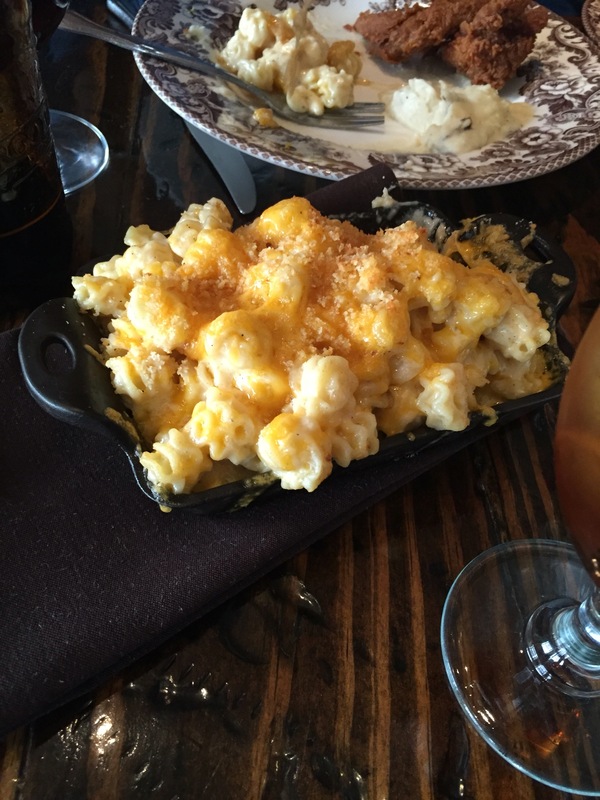 The mac and cheese was a creamy, cheesy baked pan of great. I found the choice of noodles interesting, but a good call as it held on to the creamy sauce perfectly.A great start to my mini Dallas/Ft. Worth mini adventure. That night, back in Forth Worth my friend, her boyfriend and I set out in search of an authentic Mexican taco truck. We’ve all had Torchy’s and other “chain” taco shops but the lure of authentic, straightforward Mexican cuisine took hold that night. After a quick stop to get cash we located a truck so authentic, nothing on the menu or truck was even in English. I will probably never recall the name and will always rely on them to remind me where it was these tacos were everything you could want. I tried barbacoa, carnitas, pork and chicken; all perfectly cooked and not overwhelmed with more than onion and cilantro. Their green and red salsas were spicy enough to require some thought before slathering them over everything in sight. To really make this a night out we also stopped at the Southern Classic Daiquiri Factory. Under advice I misguidedly took I got both a 12 oz and 32 oz daiquiri. One a “Twerk Sum’n” and one a special listed on a little board on the counter. The vibe inside the shop was festive Friday Night with a packed party room and a line before 10. We took ours to go so they provided little convenient tops so no open container arrests needed to be made. And as blasphemest as it sounds both daiquiris I ordered (one with an extra shot one without) were stronger than all the ones I had when I visited New Orleans. 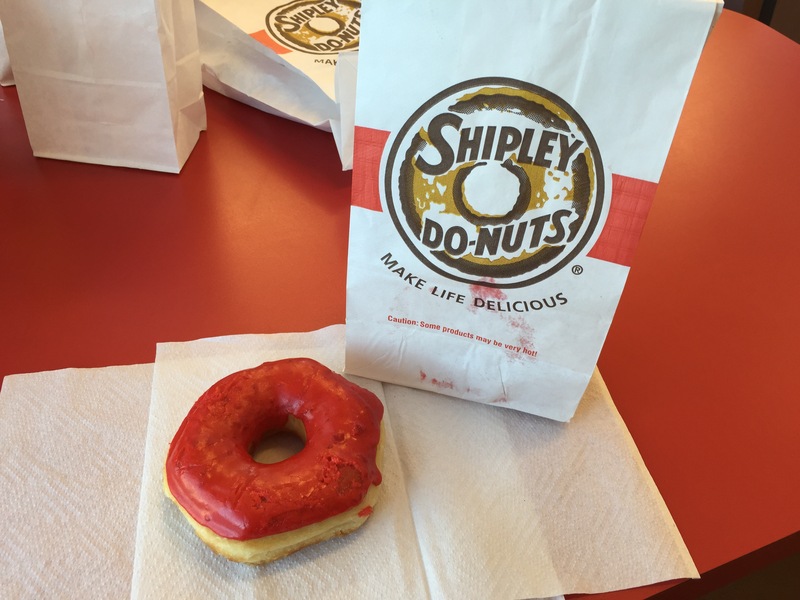 The next morning, we paid Shipley’s a visit. By far the lightest donuts (doughnuts) I’ve ever had in life I went with a cherry glazed and strawberry glazed. They were unfortunately out of country sausage kolaches, yielding my Shipley’s mission unfinished. After some other random errands and my first experience with eyebrow threading (nowhere near as painful as I expected) we headed to Steel City Pops (another recommendation from the worst). 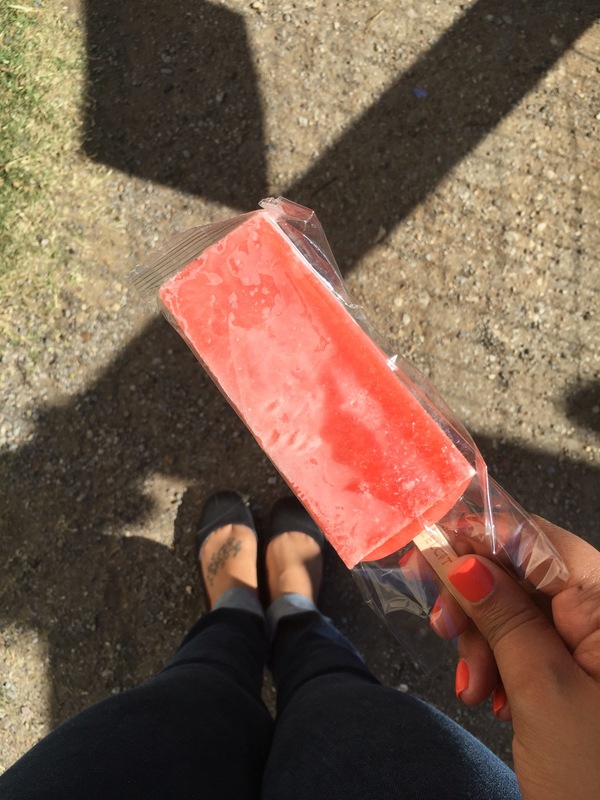 The fact that it was warm enough for us to eat popsicles while walking outside should be lost on no one but I was grateful for the opportunity. Micks went with peanut butter covered in chocolate; me, a strawberry lemonade pop. At once super tart and juicy I could see why it’s a favorite. You could literally see the strawberry seeds in the pop, affirming the presence of strawberry puree. A Pop bag is coming home with me next time. 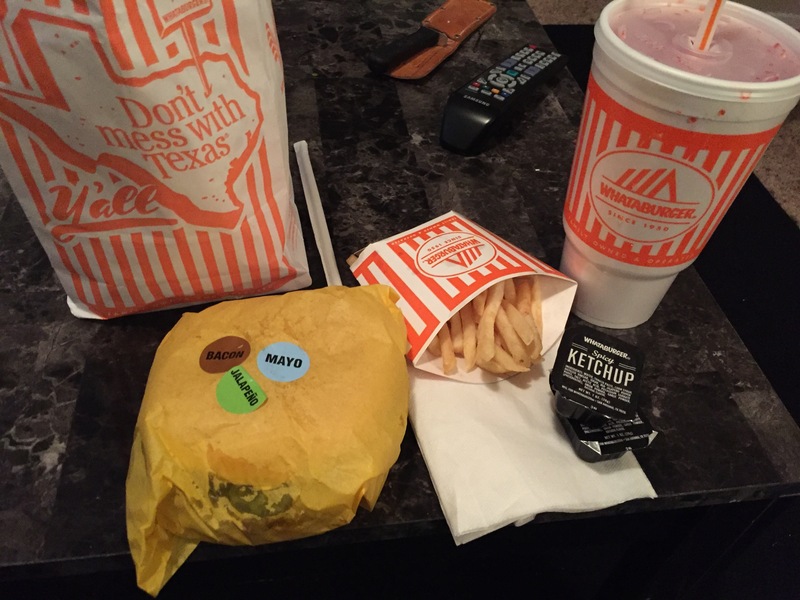 If you know me (or have just read my previous Texas trip post) you know I can’t enter the Lone Star State without at least one visit to Whataburger. This time would not be the exception. I should probably be ashamed of this next part, but I have never had bbq in Texas. Not even in college when I visited Austin. None of my trips to Houston. That had to change so off we trekked to Deep Ellum for a night at Pecan Lodge. Initially, we thought the lines would be too crazy and we’d end up turning around but we were at the counter in less than 30 minutes. Because it is very hard for me to decided one thing to eat I went with the two meat platter. 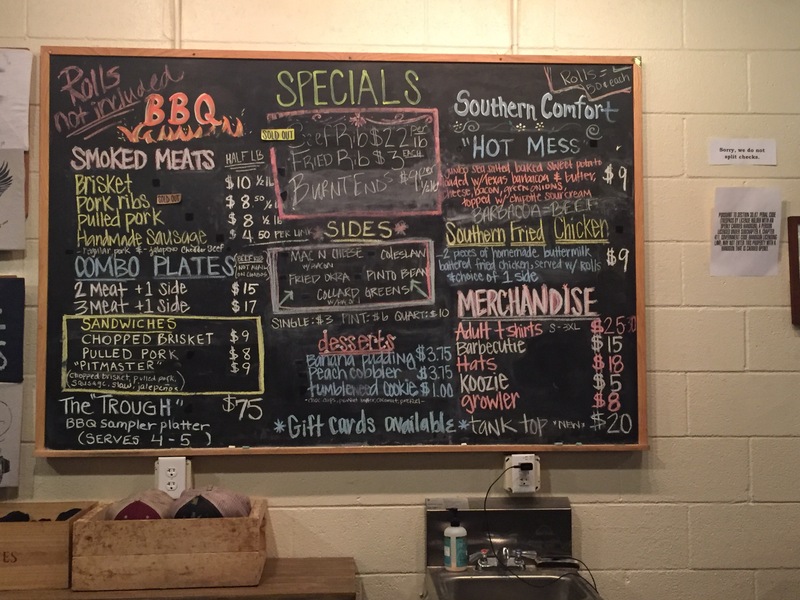 Brisket was an obvious choice and fried ribs were the perfect wildcard item. Add a side of their mac & cheese and collard greens and I was good to go. I also snagged a Blood & Honey Pale Wheat Ale while waiting for my food, brewed locally in Granbury, TX. Perfect for all the smokey goodness I was about to enjoy. The brisket was by far my favorite. SUPER juicy and buttery, it had the right amount of fat and wasn’t covered in distracting sauce. 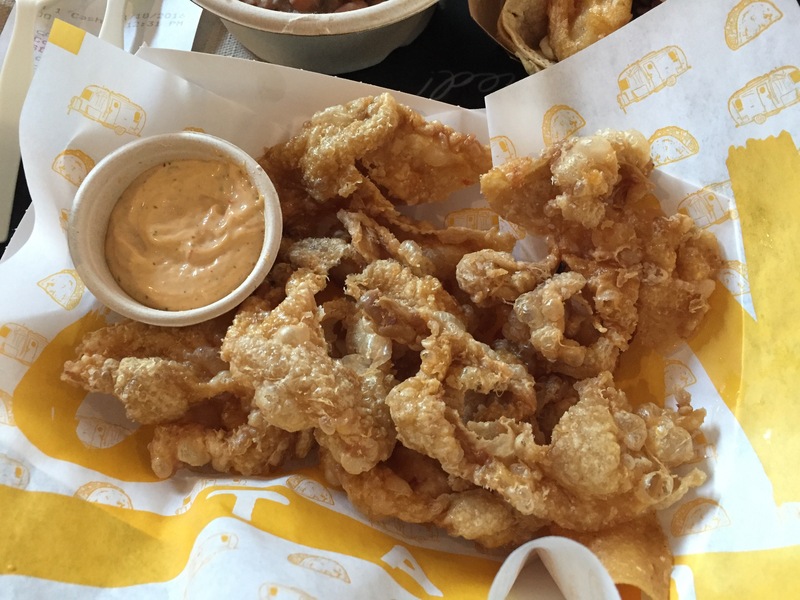 The fried rib was an interesting experience. I did like the nice crunch to the outside, but the ribs weren’t very meaty so you got the feeling that most of the rib you would enjoy, got fried up. Would love this technique employed on meatier ribs. 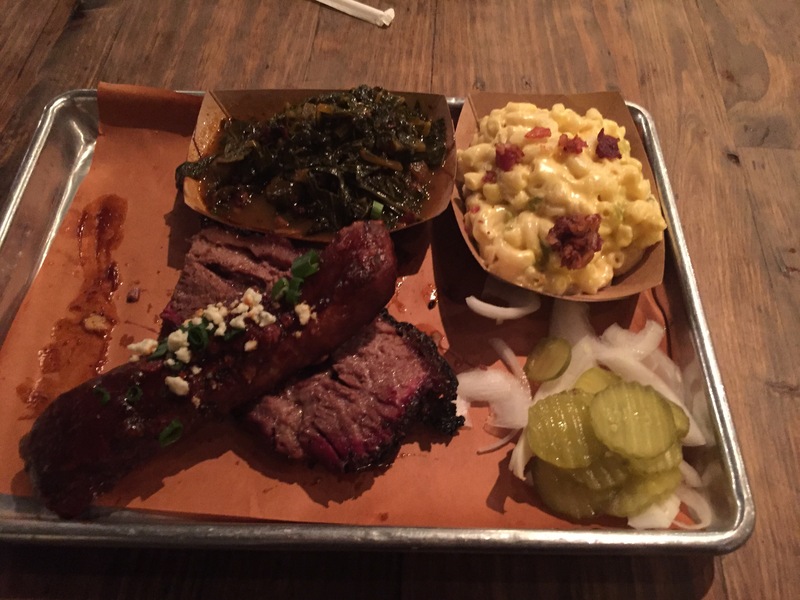 The mac & cheese was good, far better than most I’ve tried at bbq joints. The bacon was a nice touch but baking them would have raised it up a notch. The collard greens, however, were not good. They were super sweet as if a pound of sugar was introduced while they simmered. Nice tenderness and it had bacon, but I could not get over the sweet juice leaving it all on my platter in the end. 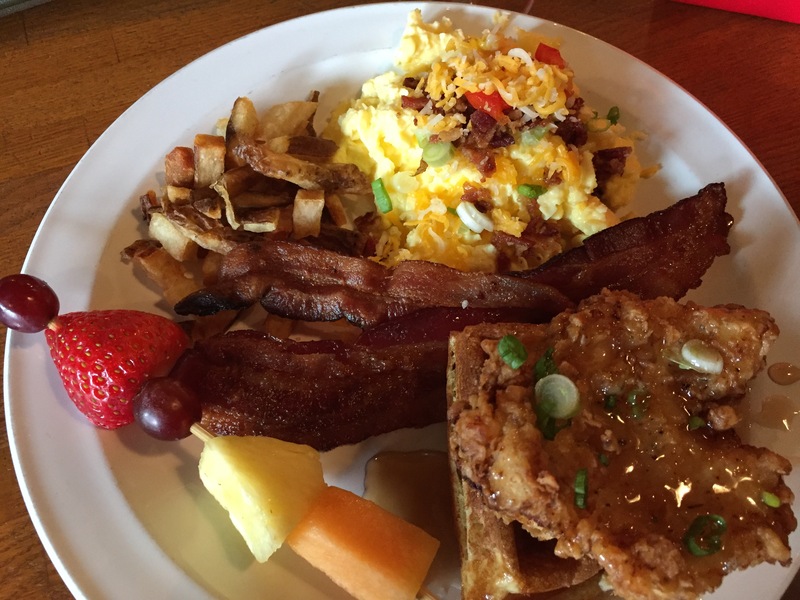 Brunch was the next day, at Brewed Forth Worth. After waiting ages we were seated near the bar. I started with a poinsettia which is a pomegranate juice version of the mimosa. Loved it since it wasn’t 85% juice. 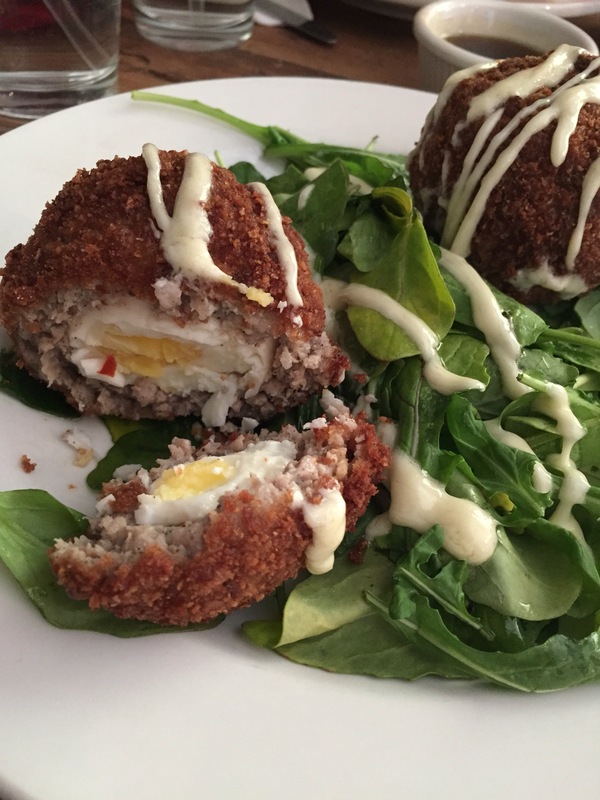 I was quite excited for the scotch eggs I ordered as I’ve wanted to try this dish in general for a while. Overall a fabulous dish that was super filling. I wished the eggs were a little softer in the middle but I’m sure that’s just part of the process in making sure the sausage exterior is fully cooked. The aioli was really good, I only wished there was more of it and the arugula was a nice contrast as well. 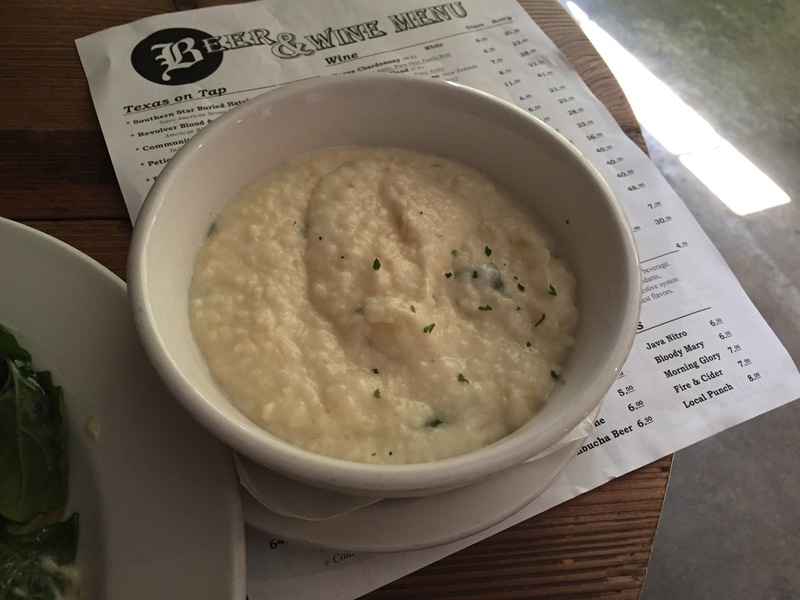 The serrano grits I ordered as a side weren’t as impressive. Don’t get me wrong they were a great consistency, smooth and creamy, but since I was in the South I expected good grits. These did not have the flavor punch I was expecting from serrano peppers. My bowl barely had any, my friend had a bit more. Could be improved with some sort of spicy cheese as well. Micks ordered the chicken & waffles with a side of grits. She loved her waffle, was less impressed with the chicken as it didn’t have much flavor. After a harrowing day that included my flight getting cancelled and talking to various people on the phone to end up paying $380 to return to Omaha before a blizzard that never appeared, I stopped at Green Door Public House before heading to the Dallas-Fort Worth airport. 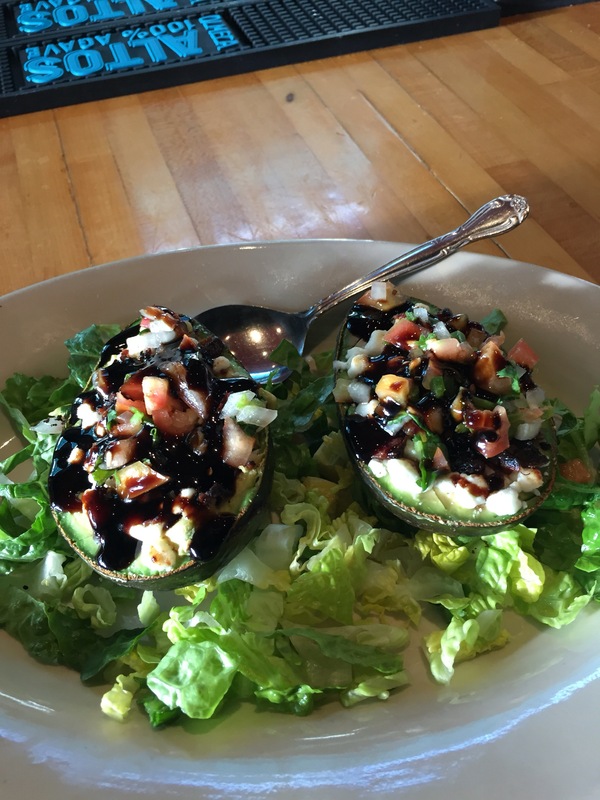 I got an Irish Mule featuring my favorite whisky, Jameson, and a baked avocado (a whole avocado halved and stuffed with goat cheese, bread crumbs, bacon, pico de gallo and topped with balsamic reduction. 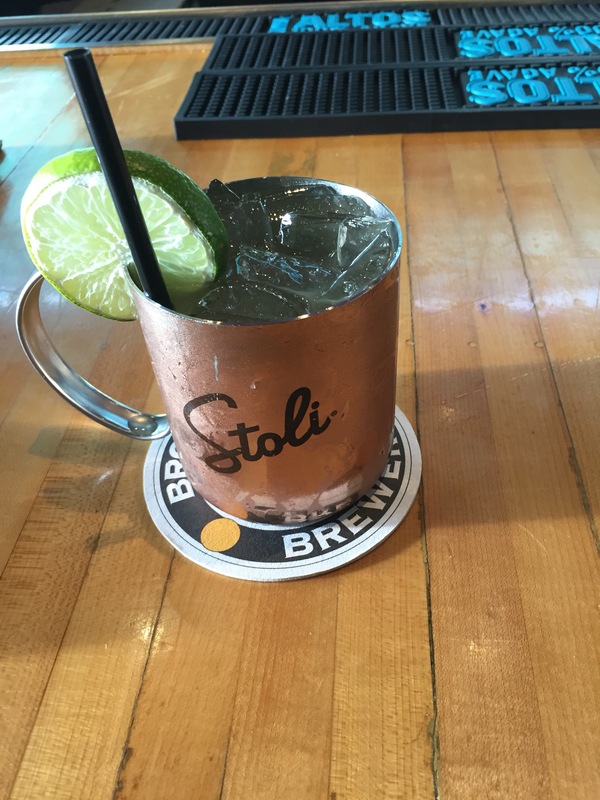 The mule was delicious as expected. I really liked the avocado in concept. The balsamic reduction was just such a contrast to the pico that it ended up being weird, especially against the slight tang of the goat cheese. I think I’d really enjoy it without the drizzle, substituting a hot sauce in instead. I always enjoy getting away to Texas and with my mother and NaNa potentially moving there within the year there will be more tasty trips to come. A few on my list for next time: Rudy’s, a Shipley’s kolache, Whiskey Cake and a return to Austin finally. A change happened shortly before Christmas in Benson. 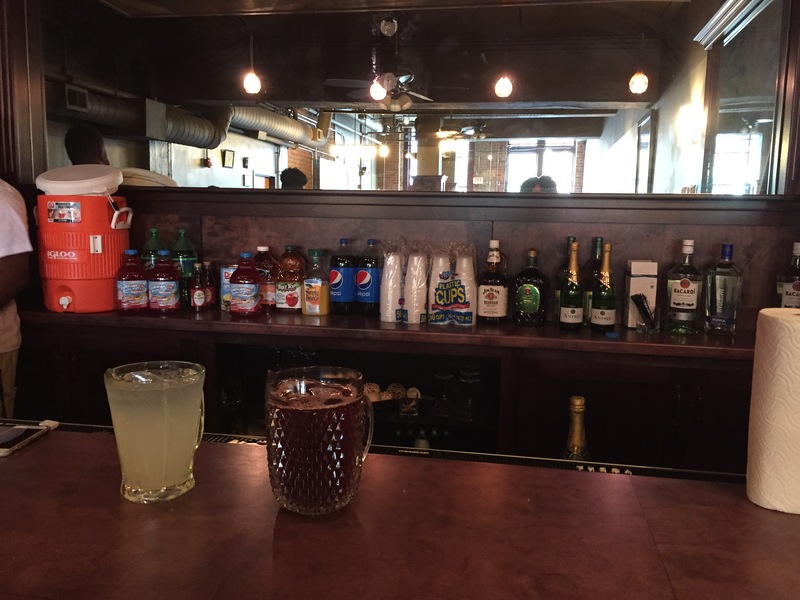 Baxter’s Pizza closed its doors and a new kid took over the small space by Infusion Brewing. 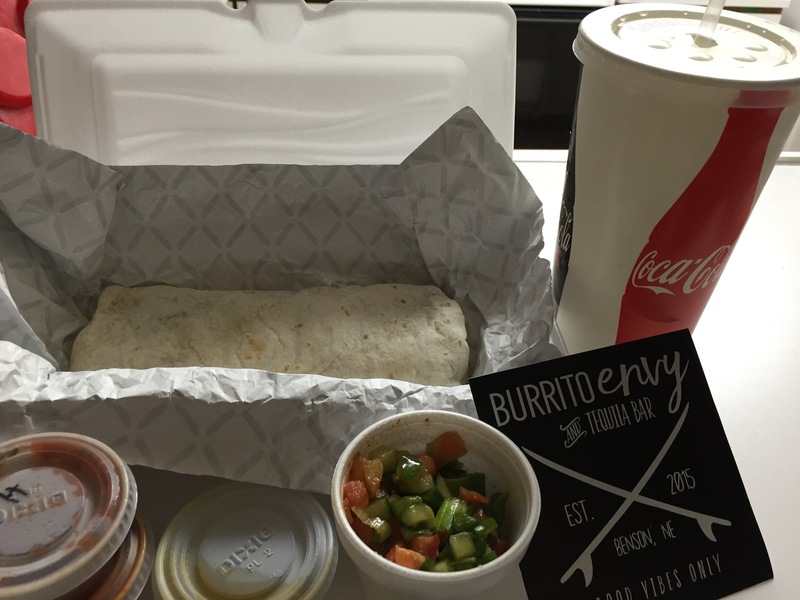 Burrito Envy & Tequila Bar specializes in just that. Assorted burrito and taco options alongside tequila based cocktails and tequila variations. Being the #TacoTuesday obsessive I am, I was quite excited about BE initially. My first visit was quite promising, the staff was much nicer than Baxter’s and food came out quickly. 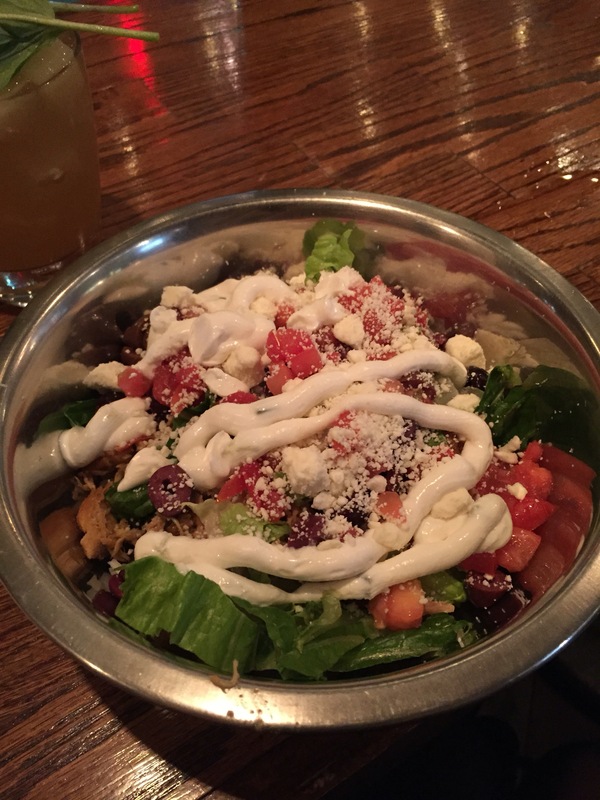 I tried the Mediterran Burrito Bowl (mediterranean chicken with rice, beans, lettuce, olives, tomatoes, feta cheese & tzatziki sauce) which was quite good. The olives made it a little salty but the tzatziki was perfect and the chicken had a nice flavor. Next was the veracruzana (agave nectar, lime, tequila & pineapple) or quite possibly the best tequila based cocktail I’ve ever tasted. The agave nectar made this mucho refreshing and the pineapples are there just long enough to soak up some of the goodness. 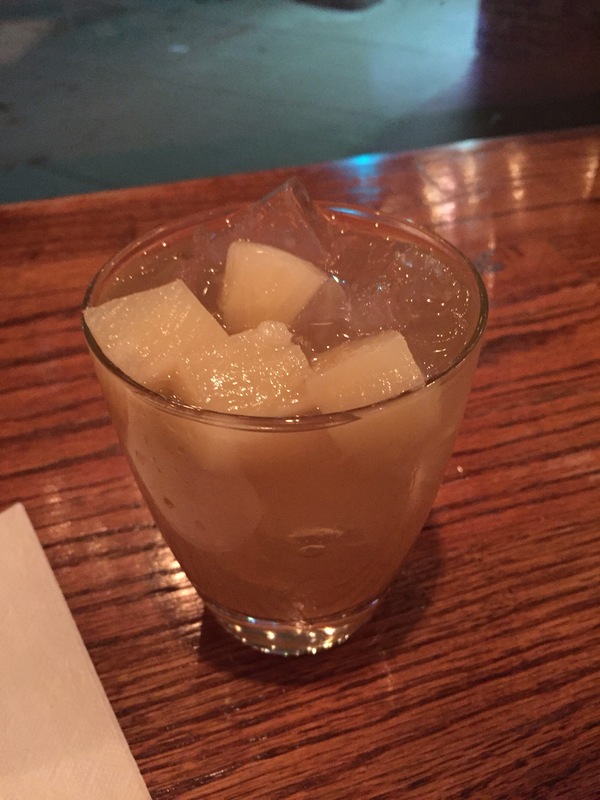 The presentation was a little confusing but it is still my go-to drink recommendation for this place. Next visit was a to-go order. I went with the namesake Envy burrito with carnitas, beans, rice, lettuce, cotija cheese & sour cream (cucumber pico on the side). After the burrito bowl I was excited about this burrito and to try out a new pico — sadness met me instead. 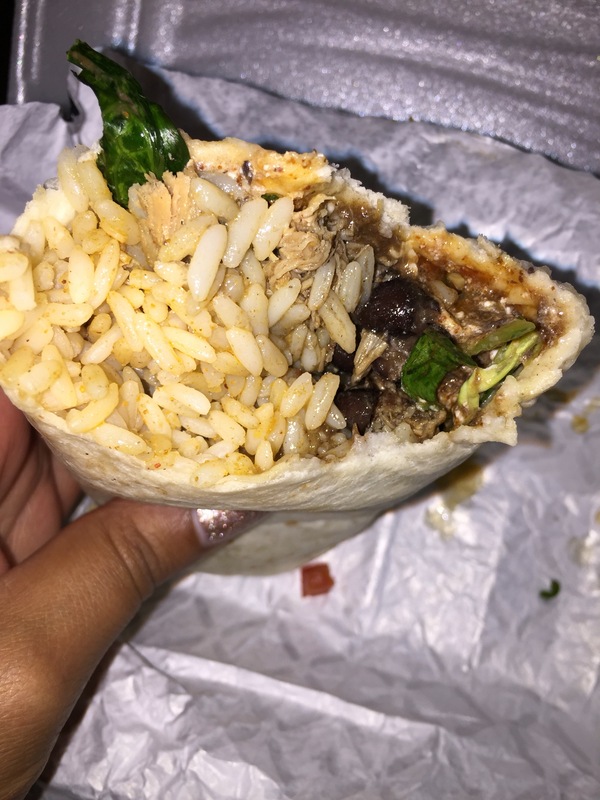 There were hardly any carnitas in this burrito. Bite after bite came back with just rice or beans. In theory, the cucumber pico is good, but really it comes across as both refreshing and bland — no real flavor profile can be found. On my last visit for this review, I went for light snacks. I ordered the chips and queso which came out in a nice sized metal bowl. I didn’t much care for the chips they serve at BE, something about the flavor is off. The queso itself was pretty good. A good consistency and you can tell it was real cheese. 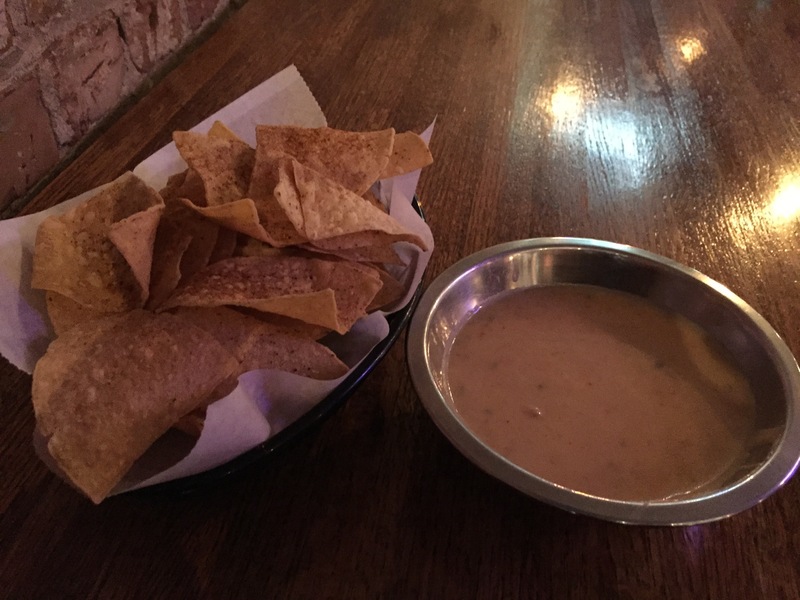 There wasn’t much spice or kick to it which is something I prefer in queso. Would be a good addition to one of their burrito bowls. 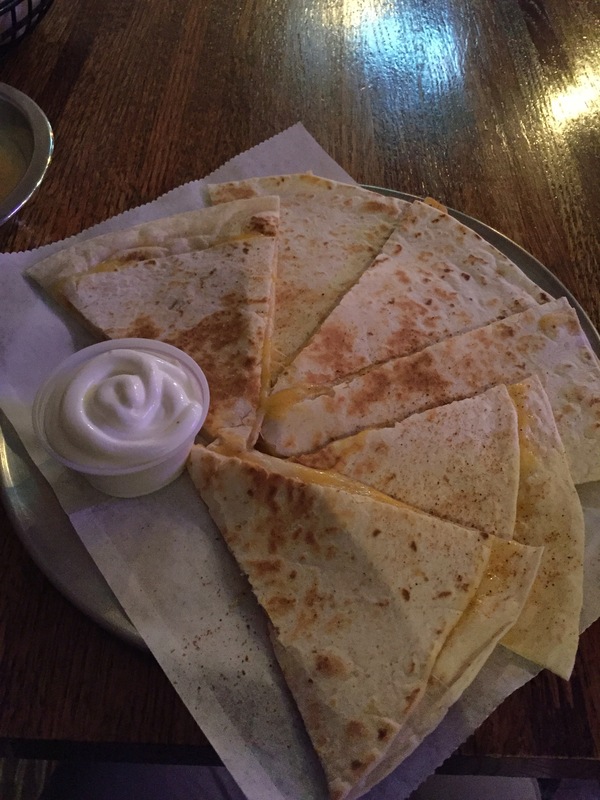 I also tried a quesadilla with sour cream. The tortilla was really good and it’s pretty hard to mess up a quesadilla so five stars there. I also tried a strawberry margarita. A far cry from the veracruzana, this marg was very syrupy-sweet. It reminded me of Don & Millie’s margaritas only D&M’s is stronger and $5 cheaper. I’d like to see Burrito Envy get better with time. It’s in a prime location and adds something nice to the Benson corridor. 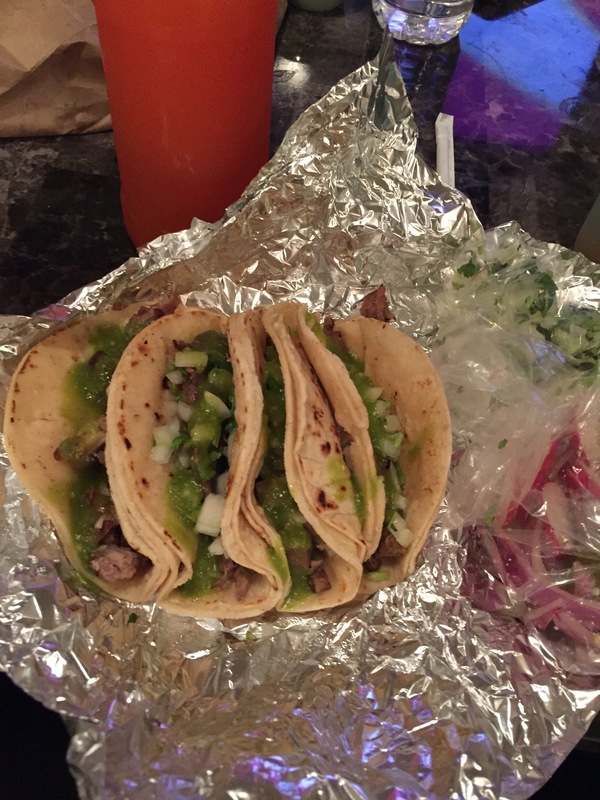 They’ve added different specials like their #TacoTuesday three tacos and a Tecate for $8. Maybe soon they’ll have something other burrito shops in town can be envious about. Probably the most important day in my Leadership Omaha journey: my small group (Just Social) is working through changing perspectives on leadership with some amazing students at Blackburn with our Lenses of Leadership project.